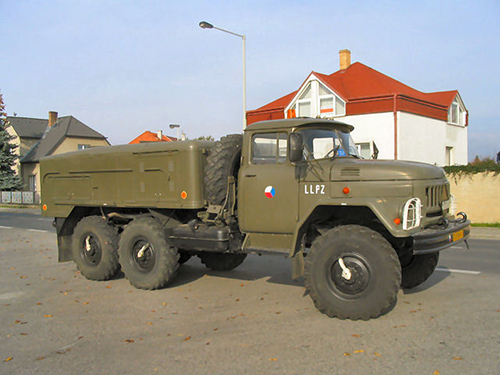 First off, what is a ZiL-131? 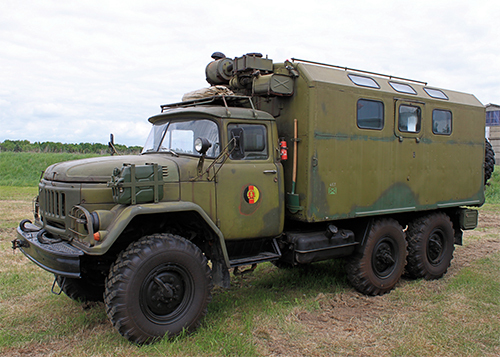 It’s a Soviet Union based general purpose 6×6 military truck that began production in 1966 and ended in 1994, with a production run nearing 1,000,000 units. 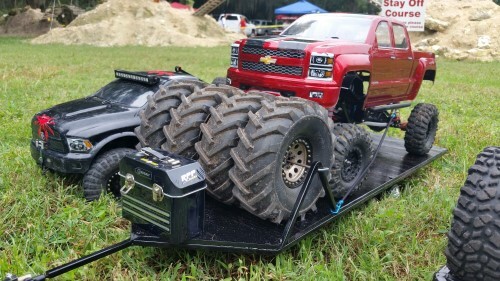 A few other specs include a 6.7ton curb weight, 3.5-5ton maximum load capacity (depending on spec), stretching just over 23′, with a span of over 8′ and stands nearly 10′ tall. Your thoughts are correct.. This is a BIG vehicle! Power plant is a V8 petrol engine that produces a whopping 150hp and reaches a top speed close to 50mph. Speed laws aren’t exactly broken here. 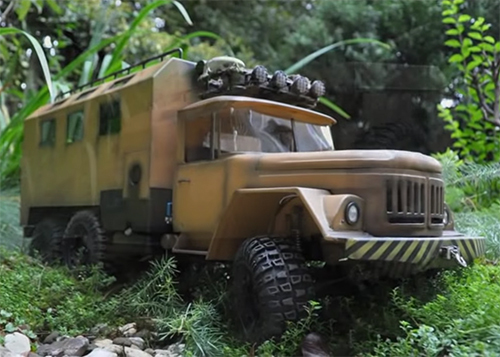 Knowing all of this information YouTube channel JoeHoncho set out to build a ZiL-131 using an SCX10 chassis as his base from which he extended that chassis making way from an extra axle, thus creating a 6×6 configuration. 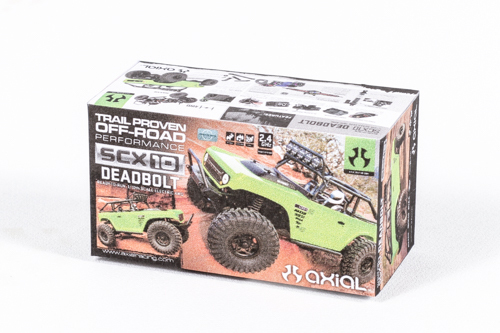 There’s also a dual motor on a single spur gear setup along with a healthy electronics system that seems to include LED lights and speaker box. 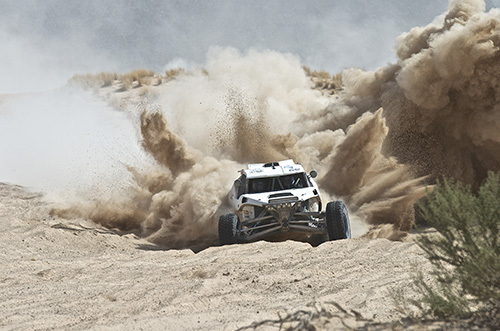 Rob MacCachren and Steve Sourapas take top honors at the Bluewater Desert Challenge! 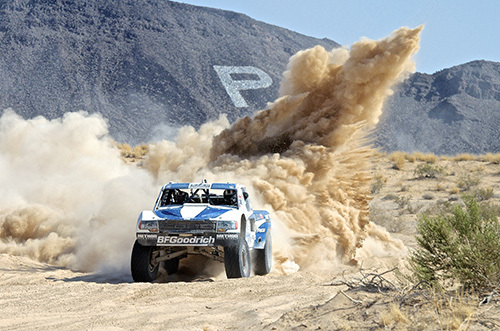 Although located in my hometown of Parker, Arizona for years, this race has never made it onto my schedule. Yet after finally having opportunity to attend this race, I believe this race is going on my “must attend” list! Everything about this race, from the time trials, to the tech inspection at the Bluewater Casino, to the the two days of action-packed racing, just screamed “fan friendly”! The action began on Thursday with time trials for Class 8000, Class 1500, and the 1400 Classes. 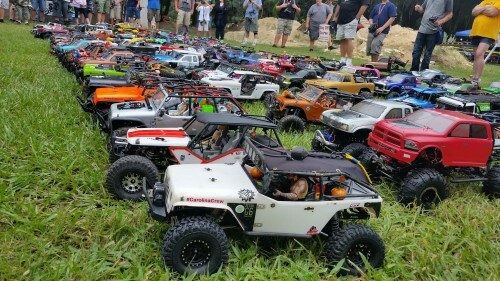 After a half-day of qualifying for their perspective starting positions for Saturdays race, everyone was invited to the BlueWater Resort for General Tires Appreciation Party at The Cantina on the river! 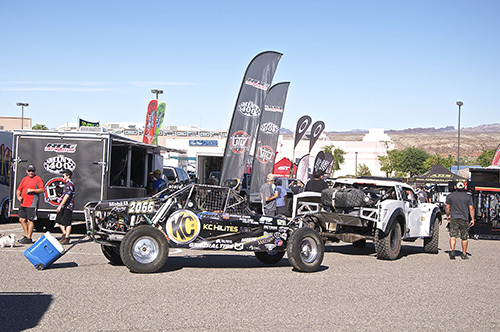 Following the relaxing evening at The Cantina, Friday was a day of Car and Truck Contingency and Technical Inspection located in the North Parking Lot of the BlueWater Resort and Casino. This gave the teams and fans the opportunity to get an up close and personal look at the drivers and vehicles about to compete in the two day race. 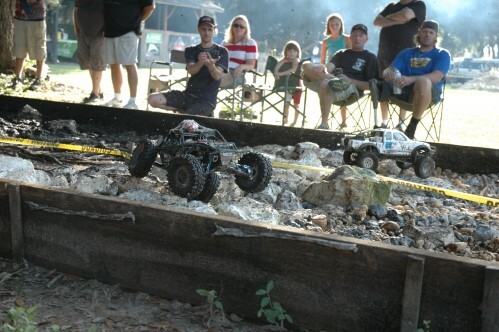 I witnessed racers, friends, and fans alike enjoying the facilities at the BlueWater Resort. Everything from gaming, the water theme park inside the casino, to just a relaxing swim in the Colorado River, there was fun for everyone! After a full day of relaxing and fun, the battle was set to begin first thing Saturday morning. 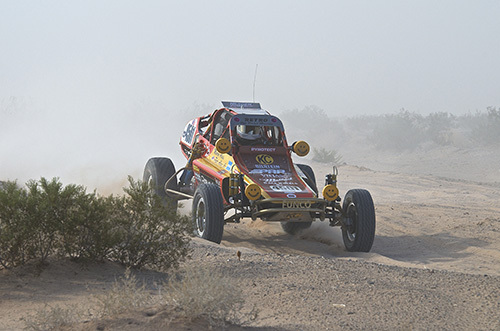 The race was set up in a two day format which allowed the teams to start day two from however well they finished in day one. 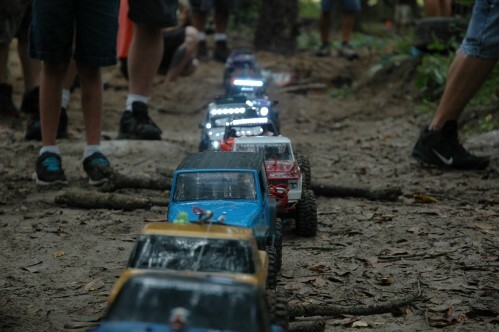 Race one would be the Cars/Trucks/UTV Classes ranging from 1900-2900-1800-4700 and would leave the line at 6:15am sharp. Following those classes, race two would be the Cars and Trucks in the 6000-2000-3000-7100-3700-1700 classes and would leave the line at 8:30am. Then the Cars and Trucks from the 1000-7200-8000 class would leave the line at 10:15am for race three. Shortly there after, race four for the the day would be Cars and Trucks from the 1500-2400 classes and would leave the line shortly after twelve noon. 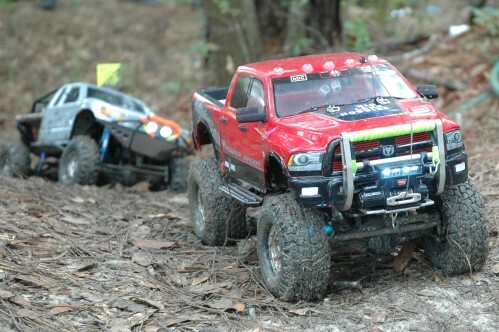 Finishing off the day, race five would be the Big Boys of the Truck Class 1400-6100 and would leave the line at 1:30pm. 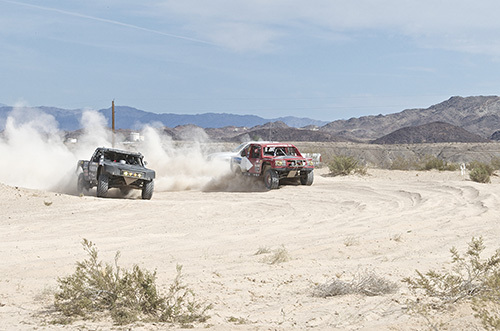 Never having been to this race before, my cousin and I chose to spend these first two races searching for prime real estate of where to shoot the faster and more aggressive vehicles from. Day one was slightly cloudy and had a little bit of a breeze blowing, which was to everyone’s advantage for not so hot temperatures and visibility purposes. We ended up settling on a location around mile marker 16. It allowed us to catch teams making a hard drifting turn directly in front of us, before heading off into Sam Andy and Ron’s Parking Lot and Marylin’s Fun Time. If we weren’t able to get a clear shot of them there, we had another chance to catch them just after mile marker 18 coming back towards us, before heading off to the start/finish line a few miles away. A few highlights from day one and our vantage point on the track came from race three in the 7200 class. 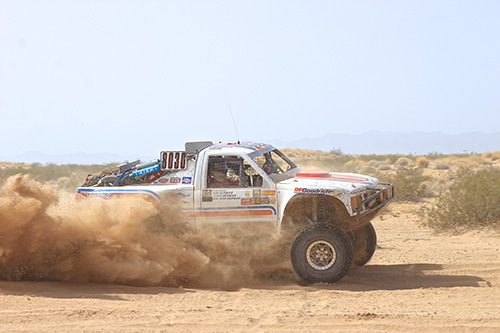 A hometown favorite and long time racer, Randy Merritt of Mongo Racing, in his 7281 truck had started the race in pole position. 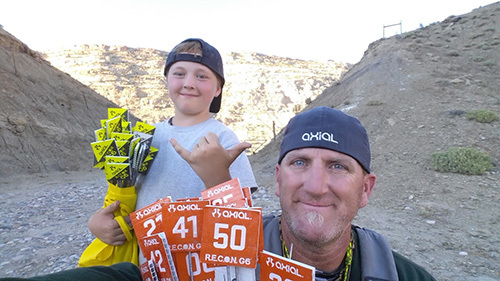 He was able to hold onto his lead until the third and final lap of the day, when he suffered a flat tire and had to settle for a fourth place finish for the day. In race four in the 1500 class, Sam Berri and Shannon Campbell were both debuting their new cars. Shannon had qualified fifth and was trying to chase down Sam Berri who had qualified on the pole. Sam was still out front when he came by us at mile marker 16, with Shannon coming by in third and not too far behind Sam. I had moved over to where I could catch them coming back by just after mile marker 18 just in time to see Sam still out front and starting to leave the field behind. I sat there for several minutes waiting for Shannon to come through, only to see that several other cars had got around him before I finally saw him come by. 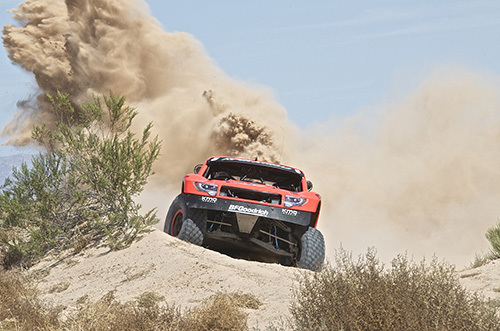 I later found out that he had hit a berm in the dust and landed on his lid, but recovered and managed to continue on and finish in at ninth for the day. 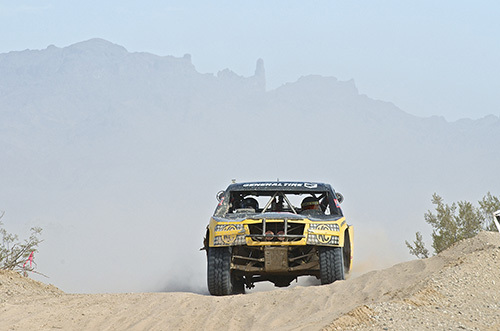 In the main event for the day, Dale Dondel had left the line first and was followed and chased by Rob MacCachren for most of the race until again in the same part of the course, Rob MacCachren came out of the dust in first place after mile marker 18. We never did see Dale Dondel come by us leaving Rob Mac to start first off the line for day two! Day two was clear of clouds with very little to no breeze at all. This meant that it was going to be much hotter, with less visibility than day one. We headed to a spot on the course that we had seen the day before. 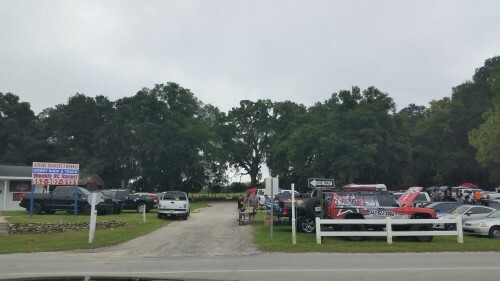 We thought this spot would be much better after the course became rutted from the traffic of day one! 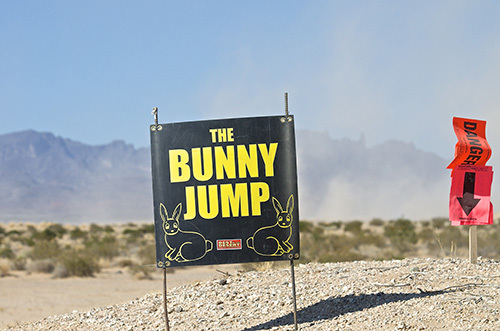 We were right at a location between mile marker five and six called the Bunny Jump. The racing from day one had developed a kicker at the jump, that was sending the vehicles that chose that lane into a violent noise dive. We could see right away that by the time the big boys got running, this was going to be the place to be! After watching the first two classes of racing in the heat with low visibility conditions. I could see that the next three classes were going to get interesting since they traveled at much higher speeds! This would make passing nearly impossible, and with the temperature reaching close to 100 degrees we wondered how this was going effect the vehicles? I did my best to capture some images in a silt bed that would show everyone how much of a struggle these drivers faced just to stay on course, let alone make a clean pass on anyone! After the first lap of race three when the vehicles tended to spread out a little, I could see once again our hometown hero Randy Merritt was on the move charging to the front even through the dust. I got myself into a position to catch him coming through on his final lap, only to see him come out of the dust with a broken front shock that forced him to stop. 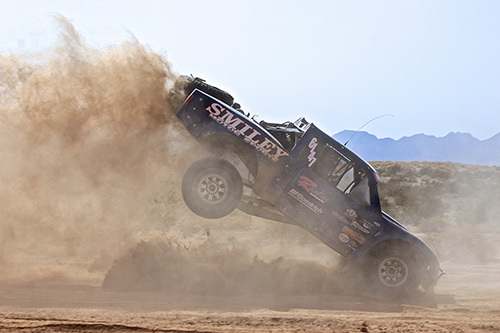 As race three came to an end, I could see that kicker at the bunny jump had grown to almost the size of complete vehicle! 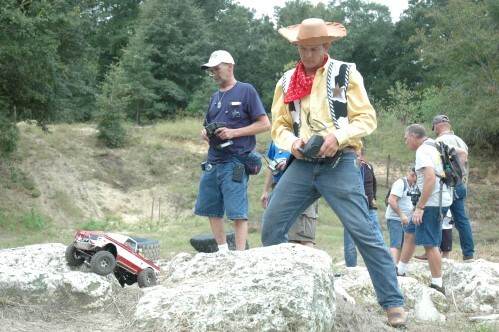 These next two class of racers would have one more serious hazard to contend with! As race four started, it wasn’t long before that kicker took its first victim. 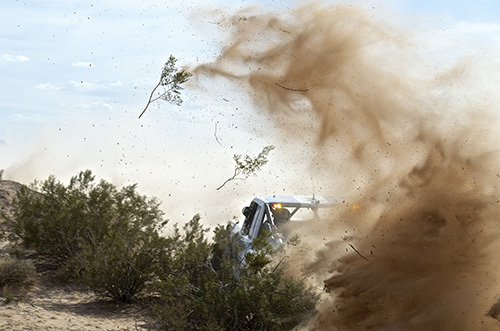 Roughly about the fifth or sixth vehicle through there, I could hear a vehicle somersaulting through the air, and when the dust settled there was a vehicle on its side. The drivers were okay, but the car was too damaged and they were out of the race! Shannon Campbell came charging through, only to lose a ring and pinion gear shortly after causing him to call it early. With Sam Berri and Shannon Campbell out the race, Kevin Thompson in the 1590 vehicle was able to bring home the win in the 1500 class. 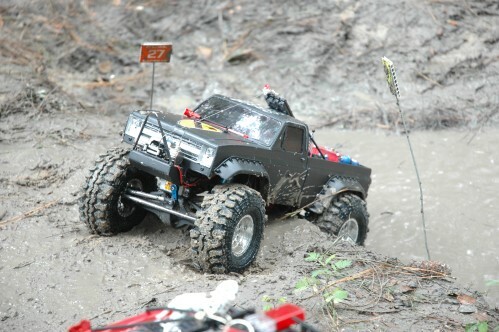 As the big boys were about to begin, I was torn between getting some awesome images of these trucks plowing their way through the silt or being in position to catch a vehicle that was bound to get hurdled through that kicker. 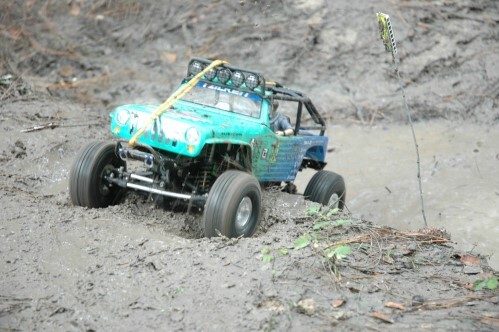 I chose to to gather some images as they made their way through the silt for the first lap, then mid way through the second lap I made my way towards that kicker and see how things went. 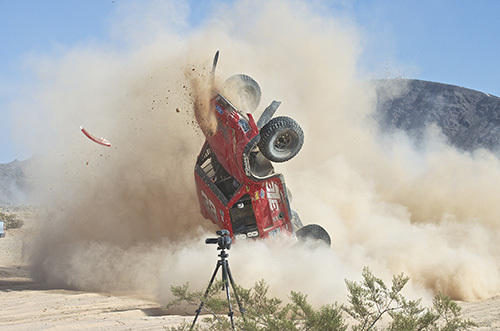 As it turned out I had just made it to the kicker in time to capture Eric Hustead in his truck number 38 doing a violent somersault! They were both okay, but the truck was also too damaged to continue and they were forced to call it quits. Rob MacCachren was clearly out front, but it appeared that Jason Voss, last year’s season Champion, was gaining ground on the leader until he was forced to stop due to an engine issue. From that point on Rob was able to keep things together and went on to finish almost nine minutes ahead of second place. 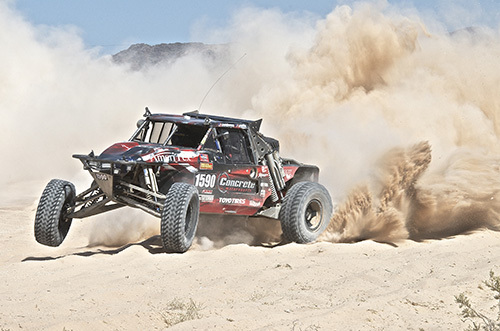 Congrats to Rob MacCachren and Steve Sourapas for taking the win at the BlueWater Desert Challenge! In conclusion, this is an incredible race that is very fan friendly. 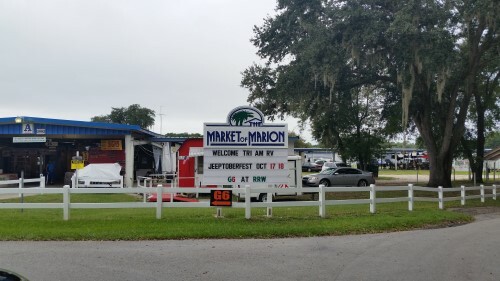 With its two day race format at three laps of 25 miles per day, it is much easier to see these drivers from several different locations throughout the race. This will be a race that I hope to get put on my schedule for next year. 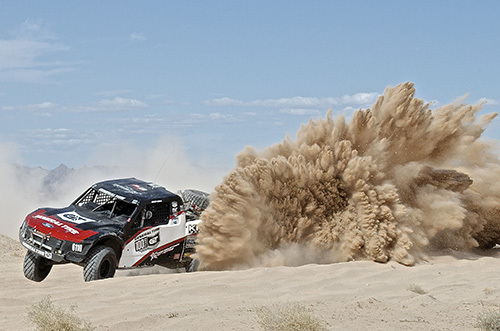 It is four days of fun and is a race that can produce some incredible images of some very entertaining racing! 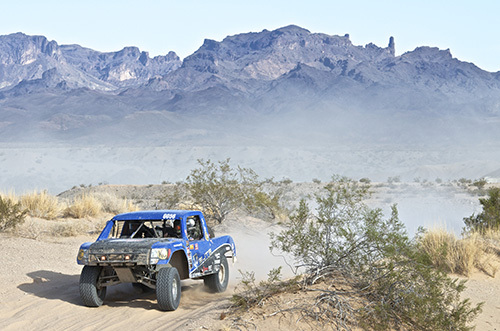 If you have never attended the BITD BlueWater Desert Challenge, I highly recommend putting this race on your schedule. You will not be disappointed! 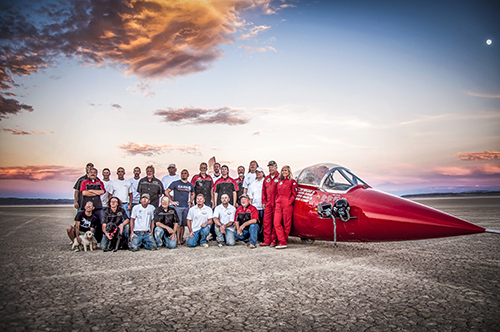 Please enjoy taking a look at some more photos we were able to capture at this incredible race..
After receiving an invitation to the Alvord Desert dry lakebed in southeast Oregon to witness Jessi Combs’ attempt at breaking the women’s world land speed record, a record that was set by Kitty O’Neil back in 1976 at a speed of 512.70 miles per hour, there was no doubt in my mind that I needed to be there for the full experience. I had less than a week to figure out a plan and make it happen. There was no way I was going to miss my friend attempt such a historical moment… it’s a world record for crying out loud!! Jessi had mentioned the plan of making speed runs over September 23-25th. 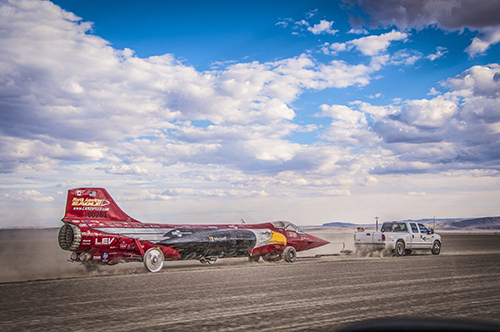 Upon my arrival to the massive lakebed in what seemed like the middle of nowhere, the North American Eagle (NAE) was in the pits and I assumed they were just going over the car from the day’s run. I was quickly informed that Ed Shadle (co-owner of the NAE) had attempted to make a couple of test passes during the day, but the car was not steering properly, though they seemed confident the issue figured was out. 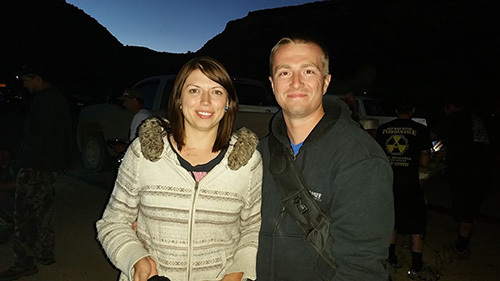 I wasn’t sure about Jessi, but I hardly slept a wink that first night at the lakebed. Never having been around anything of this nature my mind was racing with thoughts. 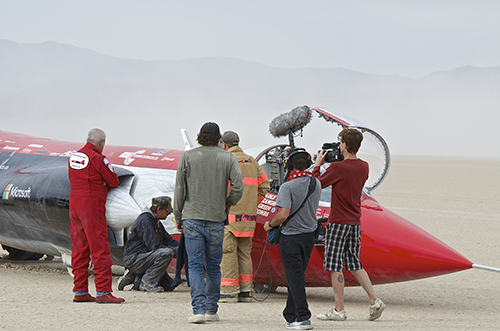 How was I going to shoot something traveling over five hundred miles per hour? Where was I going to shoot from…the start line or the finish line…or maybe the the mid point of the 9 mile course? I didn’t even know where the starting line was yet! There were so many things to think about and morning was going to come quick! As I laid there taking in the whole scene of being out in the middle of a lakebed with the stars beaming down upon me, my mind was exhausted and I finally drifted away. Before I knew it I was awake but it wasn’t even daylight yet. It wasn’t long before the team was filtering into the pits and going over the car one more time. Once all were satisfied it was doing what it should be doing, they lowered it onto the trailer and was headed for the starting line. I noticed Ed out front picking up several loose little rocks from in front of the car’s path. He informed me it was to prevent them from being sucked into the jet engine and potentially creating any damage to the J-79 jet engine. A few short minutes later he was geared up and inside the vehicle as it appeared to be all systems go. I put in my earplugs and anxiously waited to see how this all went down. As the jet engine ignited and began to wind up, Jessi pulled the tire chucks and everyone moved off to the side and out of the way. Ed and the crew exchanged thumbs up and the car headed down it’s path. It appeared everything was going as it should, though how was I to know with the giant dust cloud it kicked up. Still trying to keep my eye on the race car, I noticed everyone was already loaded up and on the chase to the finish line. I wasted no time and was on hot pursuit following everyone towards the finish line 8 miles away. It’s quite a sight seeing all the chase cars struggling to stay outside everyone’s dust at that speed, much like an off road race for the win. Approaching the NAE I could see Ed had made it most of the way down the course and was already being interviewed by the awaiting film crew. 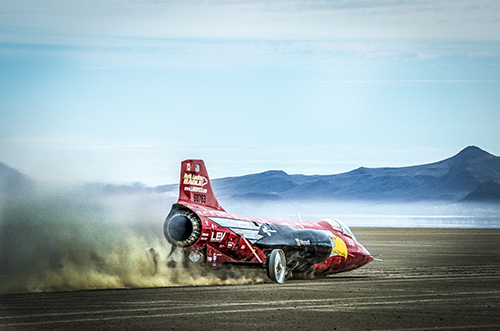 Someone called out the speed of which he was, which clocked at roughly 270 mph. 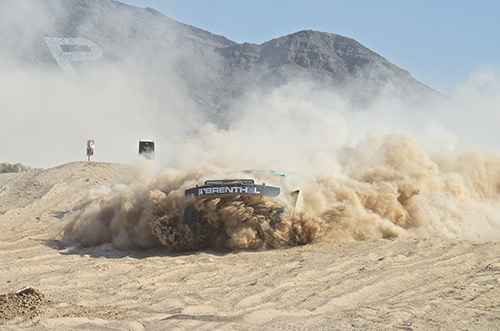 Ed replied that he had fought the wheel the whole way down the course, to which the car continued to steer to the left and was therefore going to have to take the car back to the pit and continue to be worked on. Once in the pits, the crew went right back to work, bleeding all the lines again to make sure there wasn’t any air in the system. While all of that was going on, there was another discussion between Ed and Jessi. 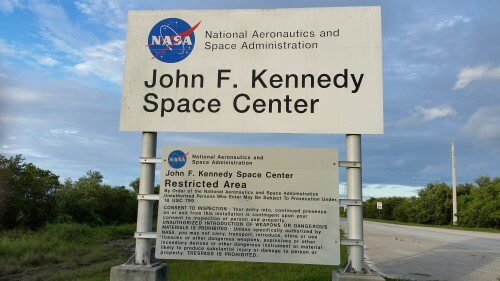 They were concerned with the amount of test runs they were having to make and not having enough fuel to complete their mission. So they loaded up three 50 gallon drums and sent two of their men to head out for more fuel. At this point, the decision was also made to pull more steering components and disassemble them for inspection. After the inspection, which didn’t reveal an obvious problem, they all agreed upon what appeared to be a scratch in the valve diaphragm plate could very well be allowing enough fluid to bypass into the wrong portion of the system causing the vehicle to pull to the left. They made some changes and bled the system free of air one more time, and after a few tests they could see right away that it was acting worse then it was before. 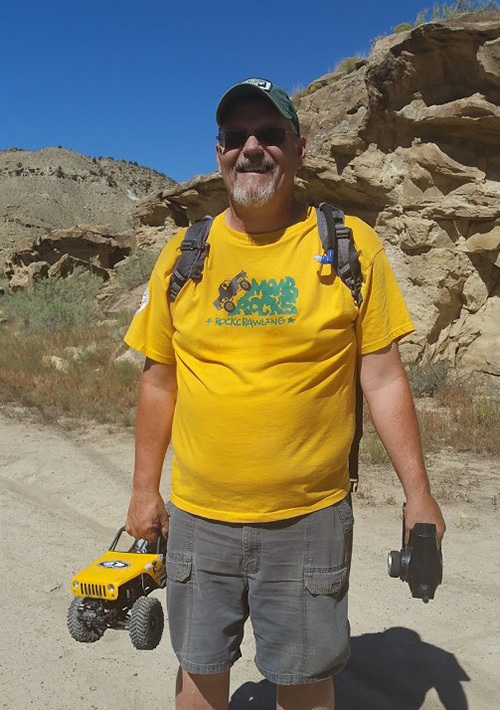 Ed quickly located a new pump out of his home state of Washington and had it shipped via UPS to a town named Burns which was 78 miles away from the lakebed. 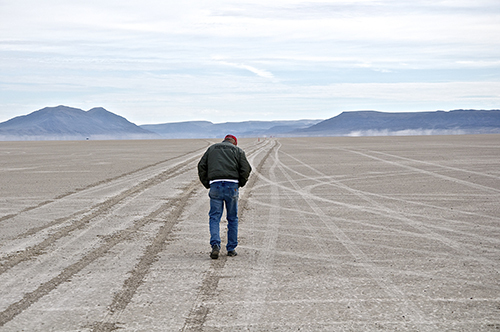 With a couple of guys staying at a motel in Burns, it made sense that if the valve arrived there by 10:00am Friday morning, the guys should be able to have it on the lakebed by noon. That would give them enough time to install, test, and make one or two runs in by dark. 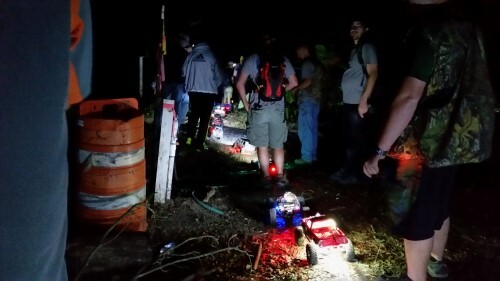 It was a lot to ask of for everything going smoothly and still get a couple of solid runs in by Friday night, but since most of the crew had to pull out on Saturday it was the only option they had. 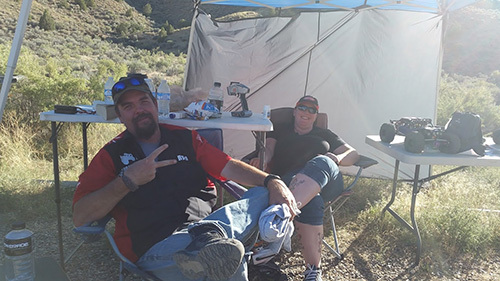 The next morning, as I sat in the hot springs taking in the whole idea of being on a lakebed in Oregon about to witness history, I could not think of a better place I would rather be! It is a very peaceful place that carries an epic energy of its own. The NAE team started to filter back in around 10:00am preparing themselves and the car for when the part arrived. The wind was beginning to pick up as we were forced to secure things down around camp. It was approaching 1:30pm and we saw a vehicle coming from the north which indeed turned out to be the boys from Burns with the new valve. As Ed pulled the new part from the box, we could see immediately it was not the same as the original part. They were able to make some adjustments though, and like most innovative situations, give it a shot. 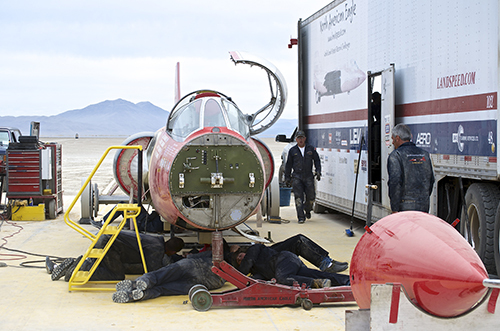 While fighting the extreme wind and dust the whole time, the crew still managed to get it installed. After bleeding the lines and running a few tests, they found out the new pump was not putting out enough volume to move the wheel! 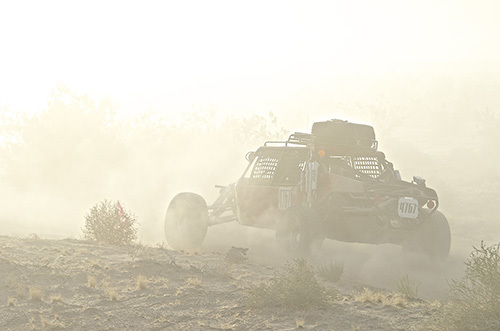 The dust storm was horrible and things seemed to not be working out, but the team was not giving up. It would have been easy to throw in the towel and call it a wrap, but this team just wasn’t willing call it quits. 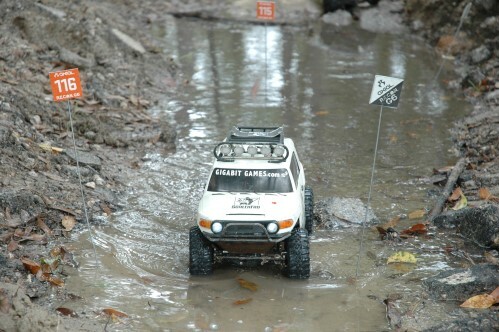 As everyone continued on, they tested the steering thoroughly and everything finally seemed to be working properly. 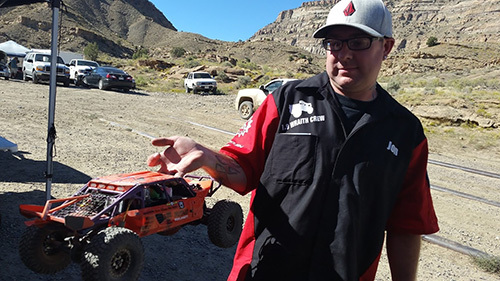 There was still one potential steering issue, but both Ed and Jessi discussed this in depth and agreed that neither of them have ever had to steer that far one way or another, so this issue should never become a problem. 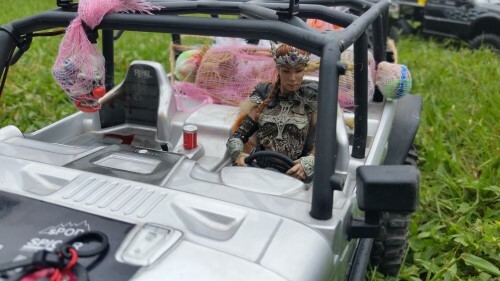 At that point they decided to give Jessi her turn in the cockpit. The wind had calmed down quite a bit by then and we all headed for the start line. I said a few prayers asking that things would go smooth and that she would remain safe. 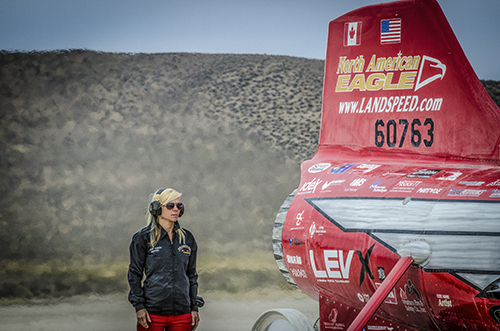 You could feel the excitement in the air as the team prepared the bird for her run. I caught the photos I wanted at the start line, then raced towards the six mile marker. After getting ourselves in position we waited for what seemed like forever! At one point we saw a large plume of dust pop up, though it did not appear to continue our way as expected. 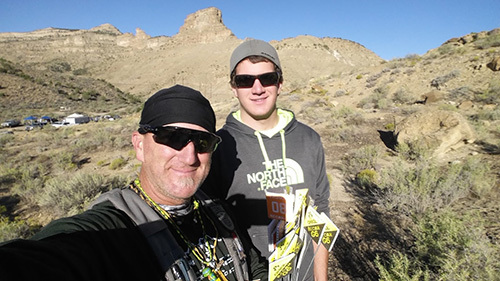 We waited and waited but nothing happened…then we saw part of the crew heading back towards the starting line. They informed us that the steering was still a problem and she had to shut it down. The flow of emotions were strong, yet Jessi was still in high spirits and agreed she will hold that record one day soon. 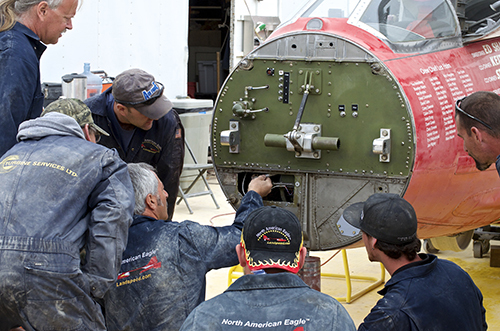 The North American Eagle team plans on taking the girl home and completely rebuilding the entire steering system to try it again at another date… that’s what we racers do! I had met some incredible new friends in those few days, and I couldn’t be more proud of the guys for how hard they worked in their commitment to breaking that record. 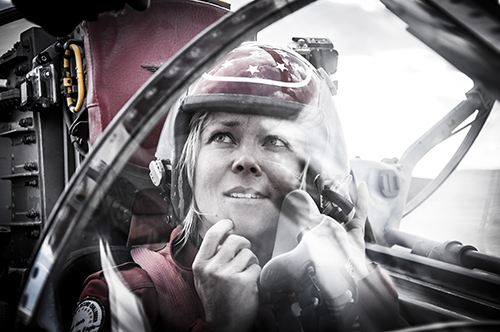 I could not thank Jessi Combs enough for the experience I had that will stay with me forever! Hopefully I will be present once again when they set out to conquer the records they aim to break. Godspeed my friends, Godspeed! …thank you for the memories. 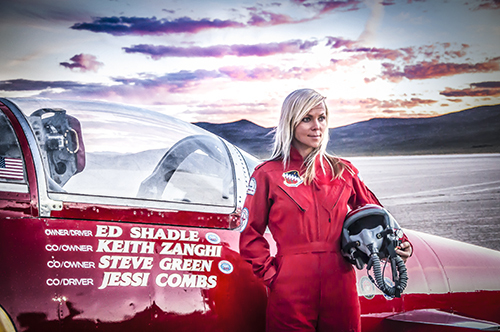 Here’s a preview into Jessi’s first attempt behind piloting the North American Eagle Supersonic Land Speed Challender vehicle to an average speed of 394mph on October 9, 2013. 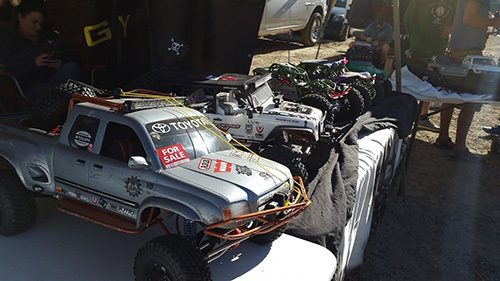 Whether your idea of competition is attending a national championship or one-upping your friend at the local park, getting your rock crawler dialed in for top performance is an obvious plus. 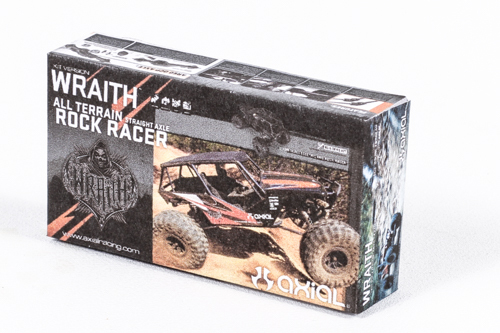 Out of the box, your Axial vehicle is setup for high performance, but so is everyone else’s. You need an edge. 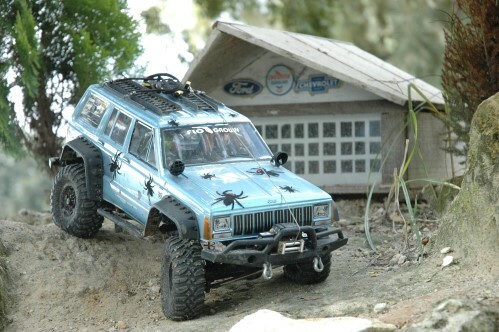 The following tips cover the key elements that you should address when you want to have the best setup crawler possible. Every aspect of tuning is not covered. These are the key elements. 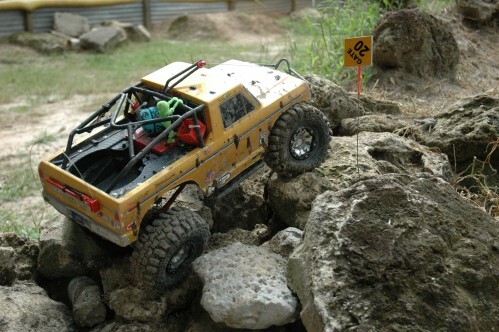 Also, as you learn about setting up a rock crawler you’ll quickly see that almost everything is a compromise; what works for one type of competition and/or terrain doesn’t necessarily work for another. Tires profoundly influence performance—maybe more than anything else. 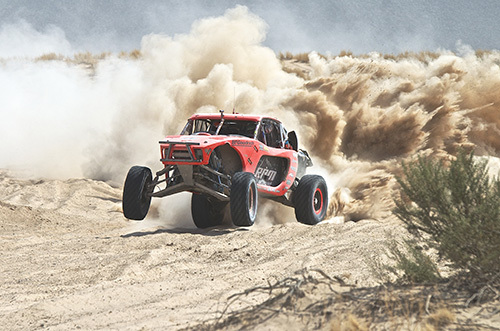 While there is no single best tire, you want to make sure you have the best tire for the conditions you’re running on. Also, not all rocks are the same, so there isn’t one best tire for all rocks. 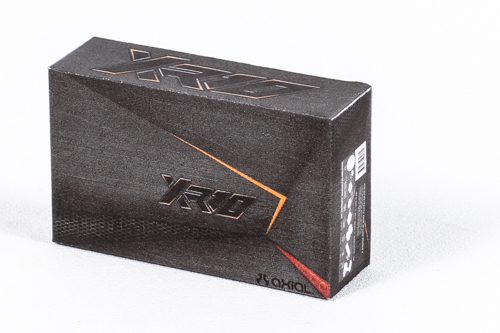 For competition, the softer the compound is better. The compromise here is wear and the need to get the tire’s foam insert right for the weight of the vehicle. 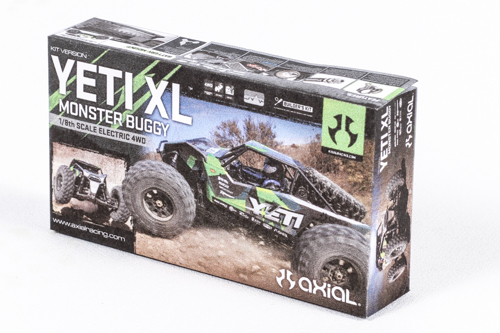 Axial’s softer and stickier compound is called R35 (white dot). 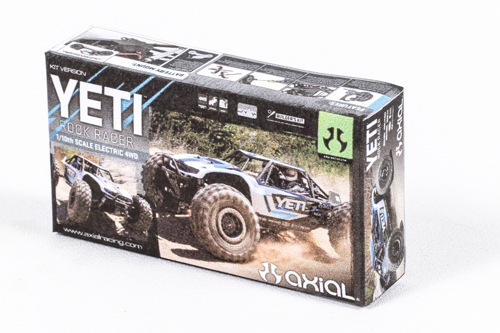 While outfitting your rig with new tires will cost you, it is money well spent. You can learn more about picking the right tire here. Specifically where your center of gravity (CG) is located isn’t important—meaning you don’t need to calculate its exact position. What is of key importance is that the CG is low—as low as you can possibly get it. A lower CG is always better. 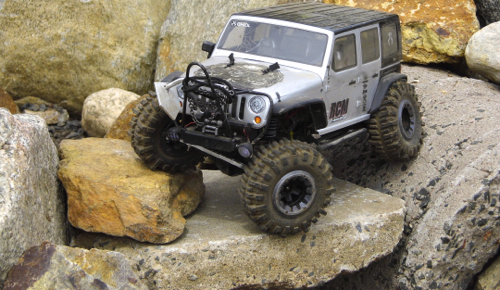 On a rock crawler, an optimized CG will help on climbs, descents and side hills. There are a number of ways to lower your CG. 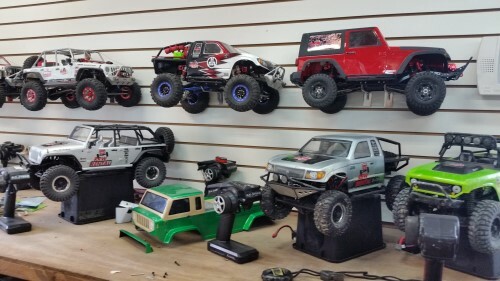 First, identify your heavy components and try to identify ways to mount them lower. Sometimes lowering a component isn’t possible, but lighter options are available. An excellent example is your battery. 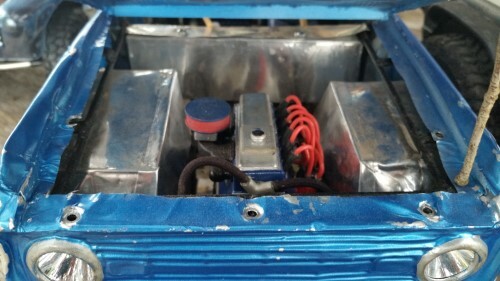 If you’re using a NiMH battery, a LiPo will make a profound difference. If you’re already using a LiPo, consider a smaller pack. 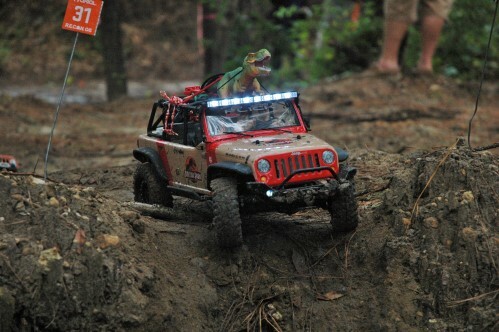 It’s understandable that if you’re trail riding you want maximum runtime. Just know that the compromise of a big battery with a lot of capacity is a higher CG. 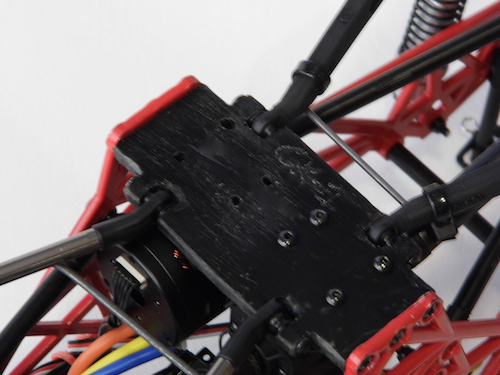 Instead of one large battery, consider two packs wired in parallel with one mounted on each side of the chassis. Another way to lower the center of gravity is to add weight to your vehicle down low such is in the wheels or on the axles. 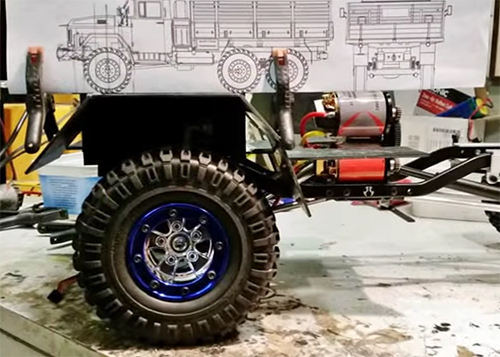 The problem with making your vehicle heavier is that it can rob power and decrease durability. A great way to lower the CG is to the body as much as possible. 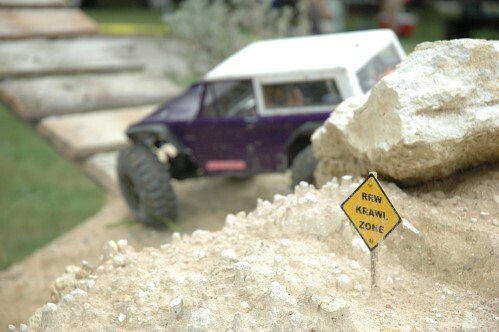 You will need to open up the wheel wells with body scissors, but doing this will make a big difference in handling. 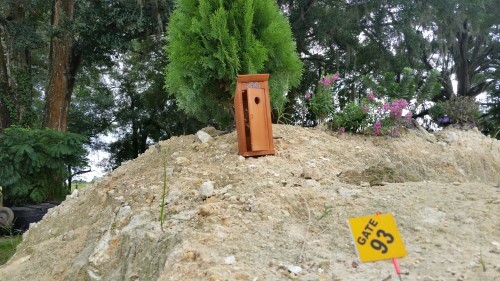 If you’re running a course with gates and judges tracking the use of reverse and each touch of a gate marker or out-of-bounds line, maneuverability is of huge importance. 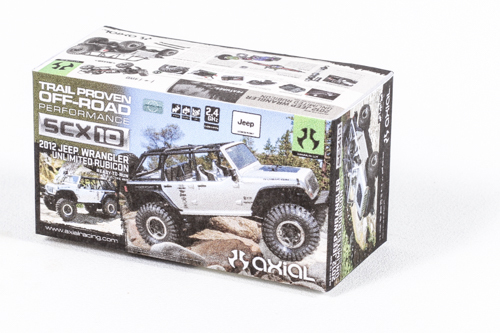 If available, high clearance knuckles combined with universal axles provide maximized steering throw. If you’re running a G6 or similar event, this can move down your list of importance. Weight distribution, or weight bias, is a close cousin of CG. 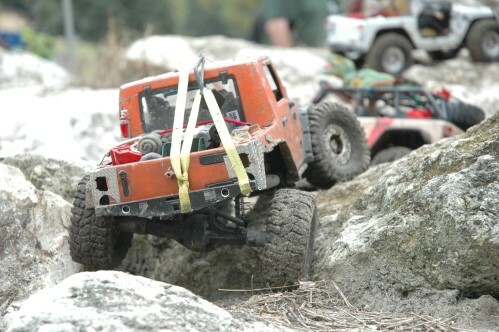 Your crawler will perform better on climbs if more weight is located over the front axle than the rear. 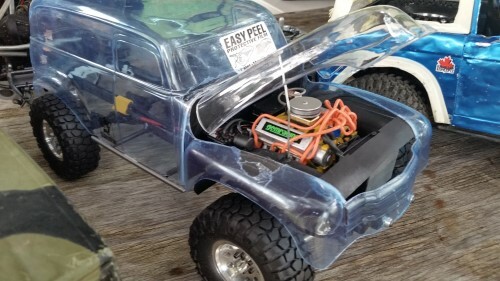 This is why it is better to have the battery mounted up front. While this makes for a tighter squeeze and is a little harder to access with the body on, the end result is improved weight bias. The difference between a front weight bias and a low CG is that with a front weight bias, you can have too much of a good thing. A 60/40 split is probably ideal. Like CG, however, it is best to start by moving components as opposed to adding weight. 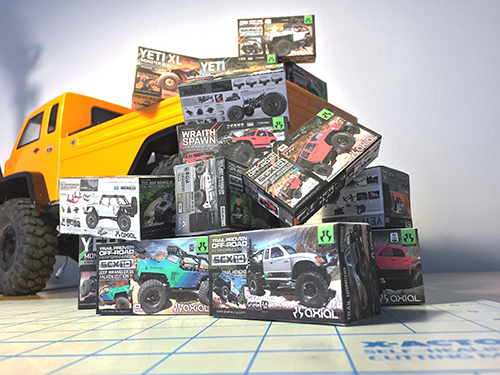 There are drivers who can compete in competition after competition and never break a single part and then there are drivers who need every single heavy duty aluminum hop-up offered. 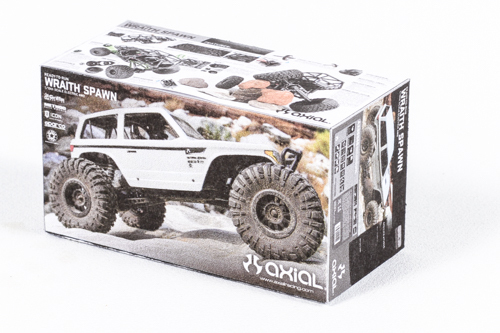 Axial has numerous upgrade parts that improve durability, but you don’t need to buy them all at once. 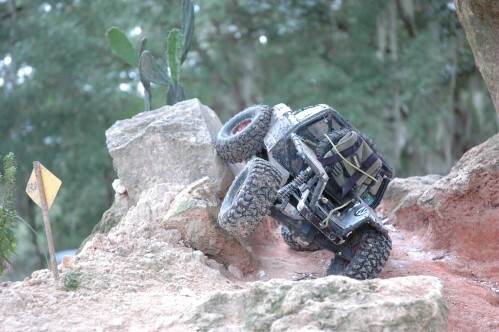 For crawlers it’s best to start at the front (aluminum servo horn, aluminum steering knuckles, aluminum steering links) and work your way back (heavy-duty gears, aluminum rear axle lockouts). 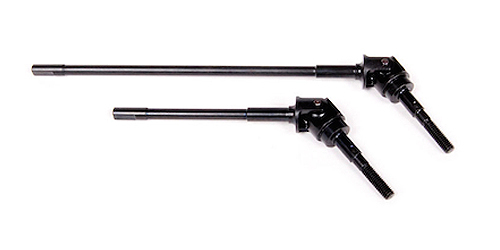 The only exception to the front to back rule of thumb is driveshafts. 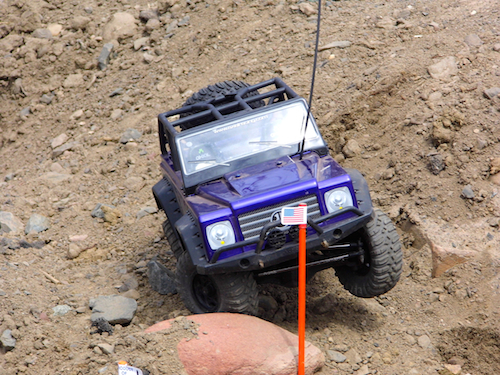 Increased ground clearance allows a vehicle to travel over obstacles without struggling or possibly getting stuck. 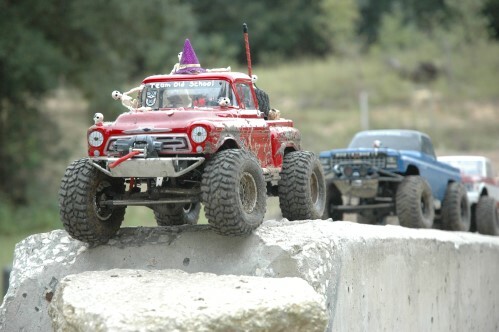 The axles are the lowest components on the vehicle and the most likely to come in contact with obstacles. 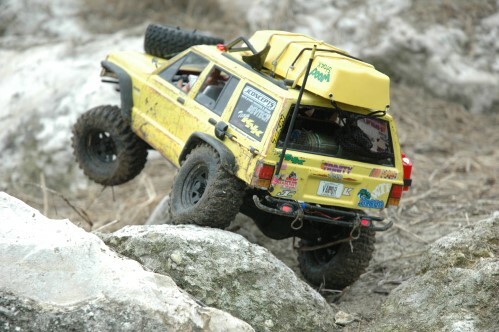 Without major modifications, the only way to raise axle clearance is to use taller tires. 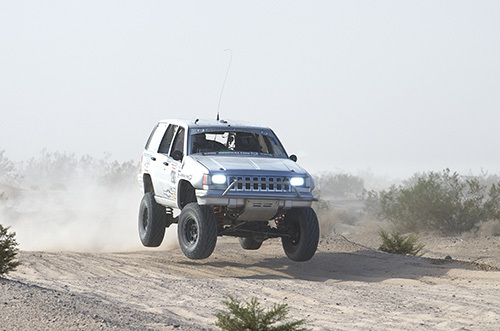 Center skid plate clearance is increased when taller tires are installed and when the suspension height is increased. The latter, however, adversely impacts the CG so proceed with caution. 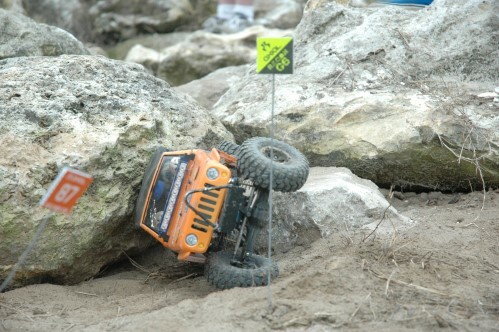 Rock crawling has changed. 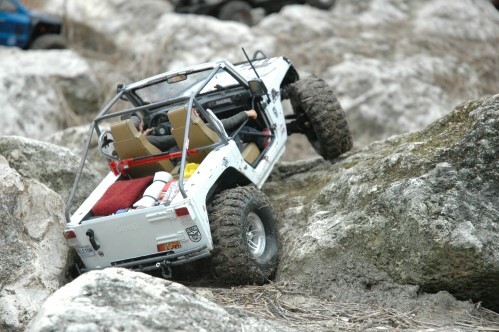 It wasn’t that long ago that rock crawling was literally crawling. Now, competitions are entirely different and you may need some speed, but it depends on the type of competition. The key here is to know what you’re getting into. 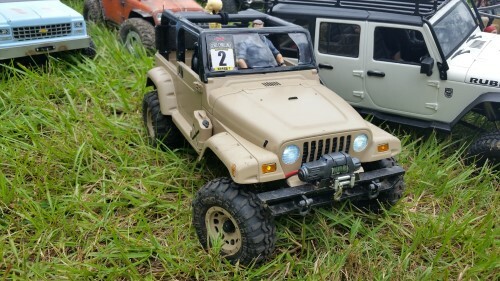 A G6 competition is going to require you and your vehicle to cover some significant ground in the shortest amount of time possible. A 55-turn motor might be good for climbing, but too slow for the long spaces between checkpoints. If you’re running a G6, consider setting up vehicle so that it’s faster than a brisk walk. In other words, it should be closer to 10 mph than 5 mph. 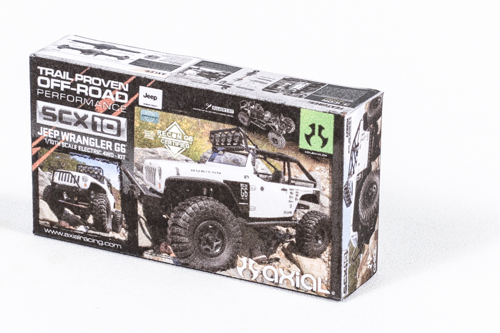 Over 10 mph and you might be giving up more crawling performance than you should, but it really all depends on the terrain. 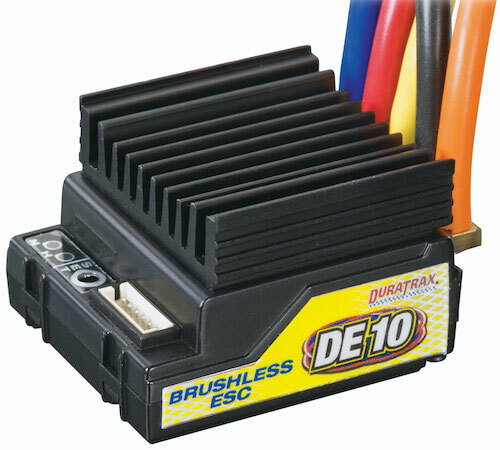 If you’re running brushless, a high voltage, low Kv setup provides the best of both worlds. 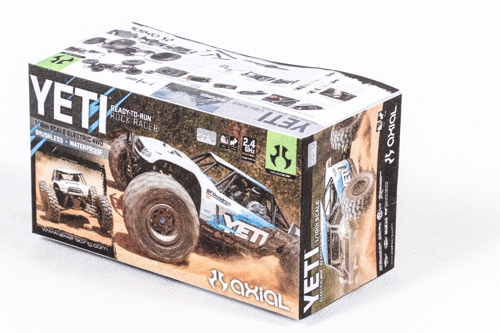 If you’re running on a super technical course with extremely challenging obstacles, a slow and torque-based setup might be ideal. 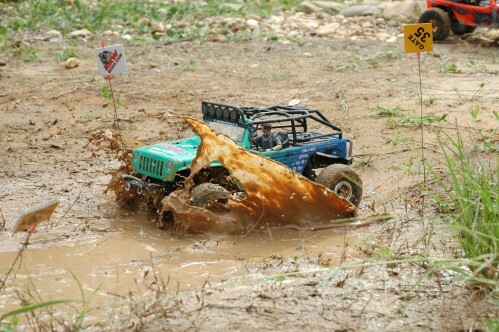 Even then, however, having some wheel speed at your disposal can come in handy on many obstacles. 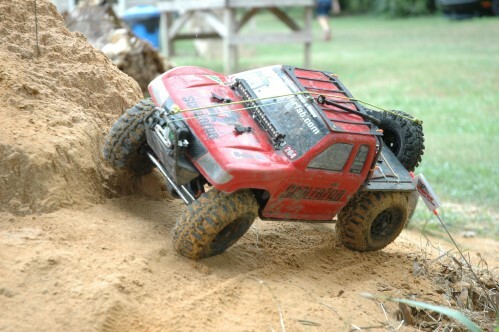 If you are expecting tips and tricks on getting more articulation out of your Axial Racing vehicle, you’re mistaken. 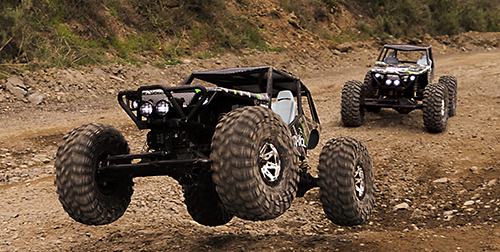 The only thing massive suspension twisting articulation is good for is flexed out photos. In the real world, it will hurt far more than it ever helps you. 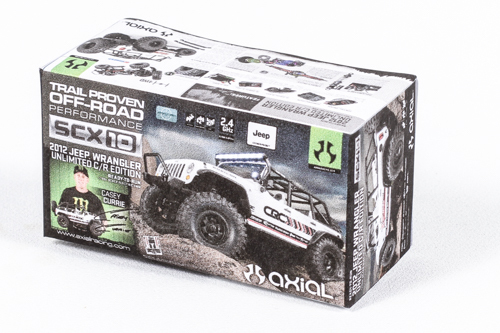 In stock form, your Axial Racing vehicle has all the articulation it needs. More will just allow it to get twisted up like a pretzel. This article explains why articulation is often misunderstood and overrated. 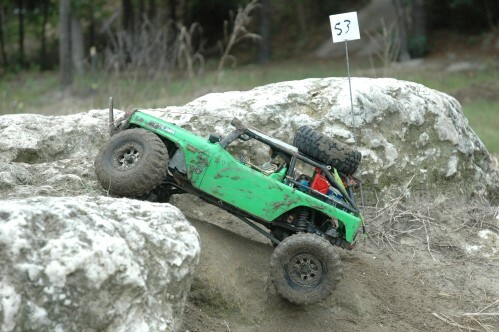 Rock crawlers generally work best with slightly stiffer rear springs than front springs and you want to avoid an overly soft suspension that easily collapses when side hilling. 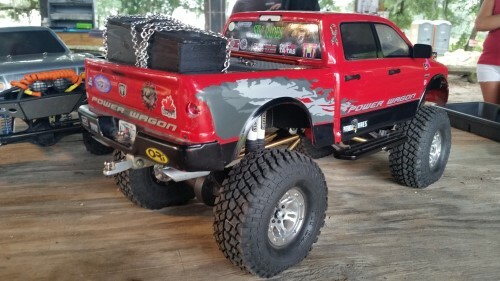 Most people don’t consider how increasing the weight of the vehicle with hop-ups and accessories might increase the overall weight and thus require stiffer springs. 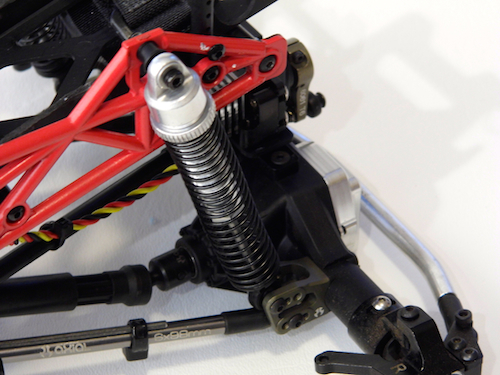 Stiffer suspension also resist torque twist far better than soft, mushy suspensions. 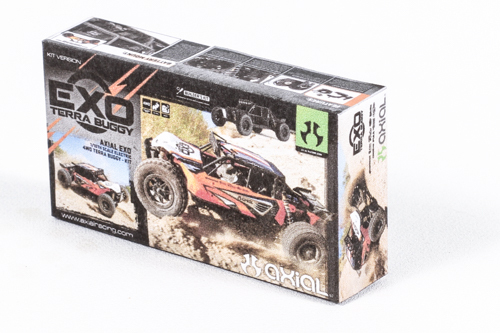 Posted in FAQ, NEW TO R/C? 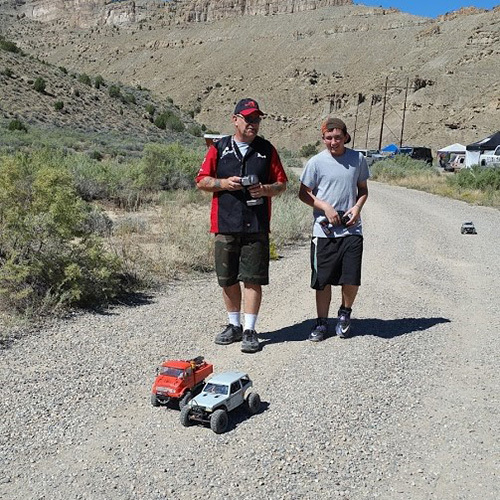 Could you imagine showing up to the track with a 25-year-old RC car? Me either. 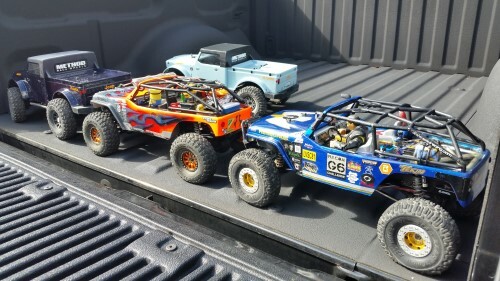 Like all other club racers, I’m a sucker for having the latest and greatest, and when I wanted to build a new monster truck for side-by-side racing, I couldn’t bear to start a new build with outdated equipment. But, that’s exactly what the vast majority of solid-axle monster truck racers do when they lineup for side-by-side action. 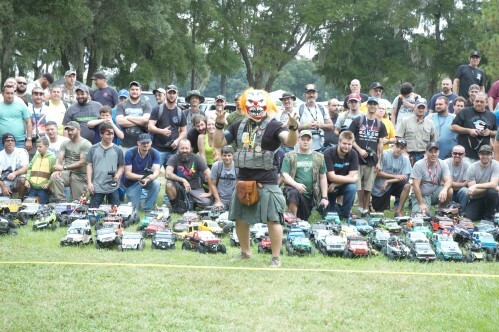 I am, of course, making reference to the Tamiya Clod Buster and its legions of loyal owners. I am a huge fan of the Clod, and you probably are too. 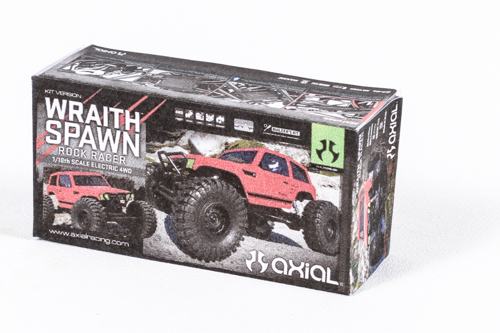 Tamiya’s classic car crusher is truly iconic and one of the most significant releases in RC history, but while we celebrate its 25th year, it seems odd to race it in anything other than the vintage class. 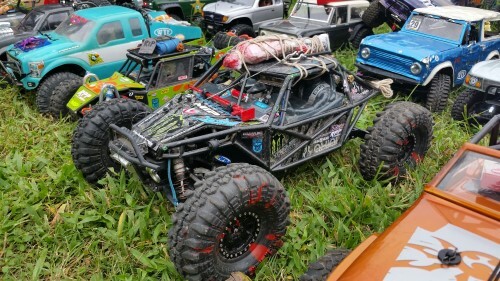 I knew with some tinkering and some creativity, I could build a modern monster for racing. 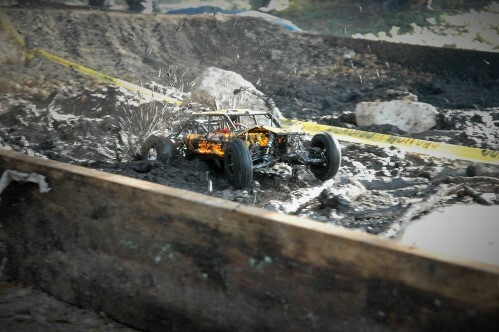 In my opinion, side-by-side monster truck racing is a lot like rock crawling. Huh?! Lower that eyebrow and let me explain. 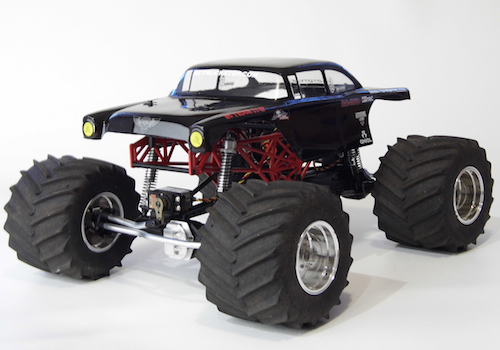 I see the appeal of monster truck racing being in both the performance and scale appearance of the trucks. 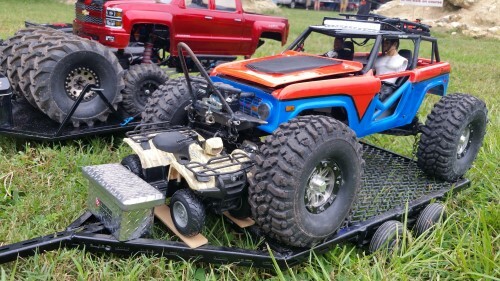 As such, many of the race chassis just don’t do it for me because while they perform well, they don’t look anything like a real monster truck’s tube frame. Going the other way, while not all are super heavy, steel or even brass tube frames are generally not very light or built with a low center of gravity. 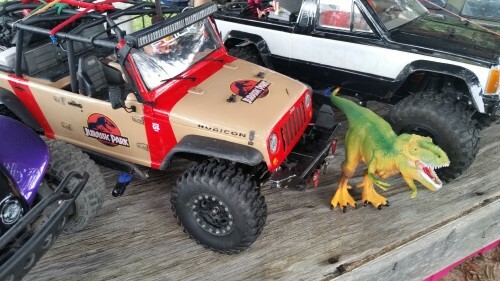 They look great, but aren’t the first pick for racing for a reason. 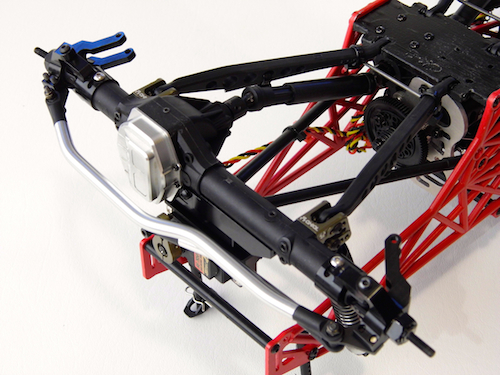 I wanted the lightness of fiberglass, graphite or plastic and the realism of a tube chassis. 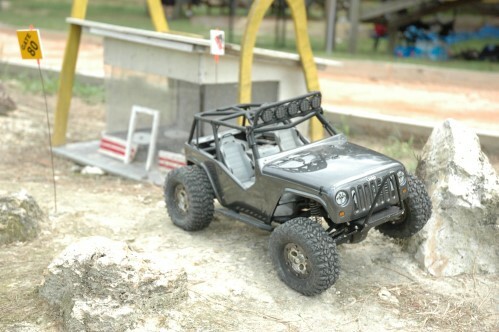 As such, I went with HPI Wheely King plastic side plates. They are feather weights and look like the real deal. All I used from the stock Wheely King are the side plates. 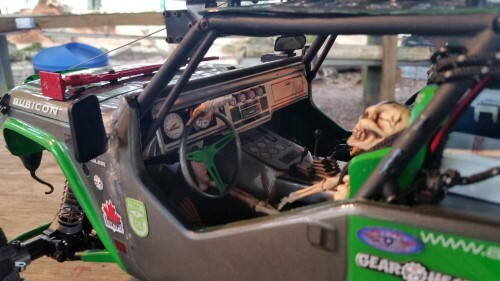 To get a more custom look and inspired by the way the full-size Grave Digger’s chassis is painted green, I painted the frame rails with a plastic-specific spray paint. The cross members I made are solid Delrin rod that I cut to length and drilled for 3mm hardware. The only possible downside to the Wheely King plates is that they allow a noticeable amount of flex. 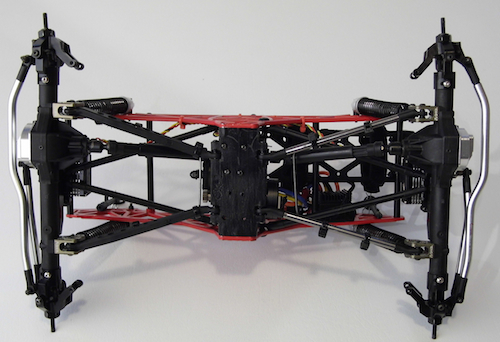 Even with five Delrin rod cross members spanning the chassis, the finished frame can be twisted by hand. It’s unlikely this will negatively impact handling, but it’s worth noting. 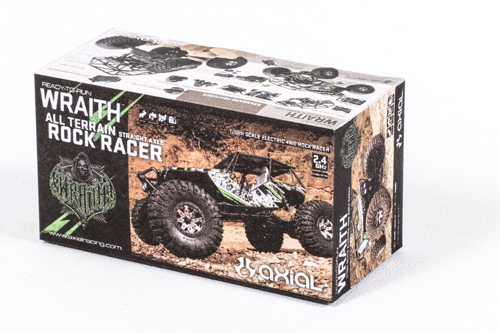 While the frame rails are what most people initially notice, the real heart of the truck is the use of Axial Wraith drivetrain components (axles and transmission). I’ll outline the benefits of the Axial components a little later, but the transmission required a custom skid plate to be fabricated. While I would eventually like to get a higher quality skid plate professionally machined, I was able to fabricate my own out of plastic. I started with some blank plastic stock that I received from my friend and fellow RC’er Tom St-Onge and from Pin Shop Hobbies in Oakville, CT. 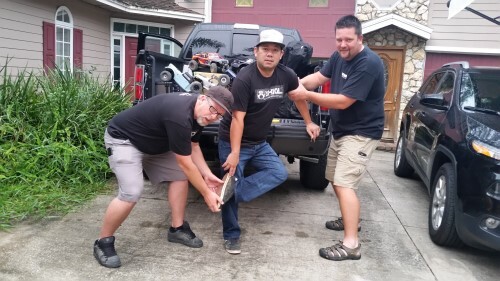 When designing the new skid plate, I used my preferred method–CAD or Cardboard Aided Design. In addition aiding in marking the transmission mounting holes, I used the stock Wraith skid plate as a guide for how to position the lower link mounts. 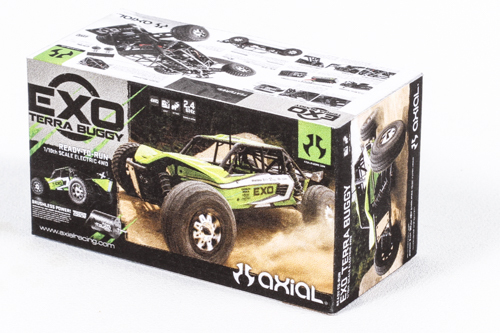 Axial’s engineers know heaps more about suspension geometry than I do, so I saw no need to mess with their design. One I had all the measurements I needed, I made cardboard template. And, after transferring the template to the plastic, I cut the template (hacked at times, to be honest) with my bandsaw and Dremel rotary tool fitted with a reenforced cut-off wheel(See safety note below). 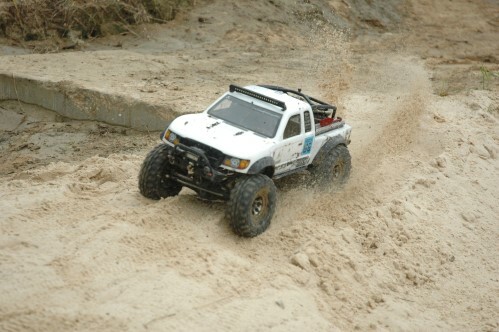 The determining factor in how wide I built the skid plate was actually the axles. 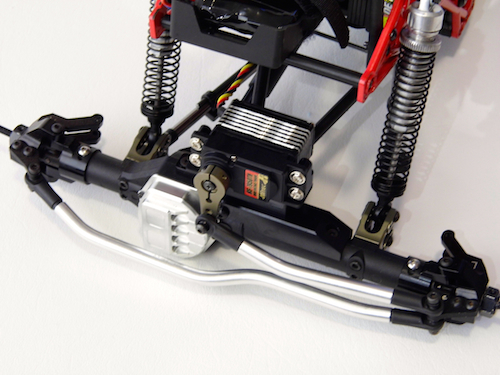 I wanted to use the AR60’s stock shock mounting positions to maintain as much of Axial’s geometry as possible. So, I built the skid plate to position the side plates about 4″ apart. The link geometry of this truck is the same Wraith with the exception of link length and the upper inner link mounts. 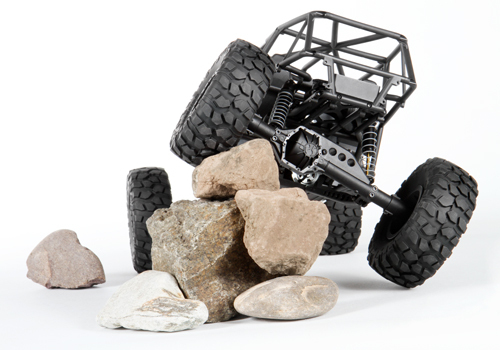 As I have said, I took as much as possible from the suspension design of the Axial Wraith. I did vary from the formula when building the link length. 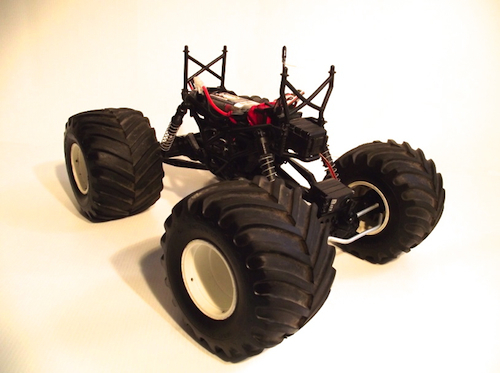 I made the links longer to achieve the 13-inch wheelbase I desired. I also made the rear links slightly longer than the front to increase front of center weight bias. 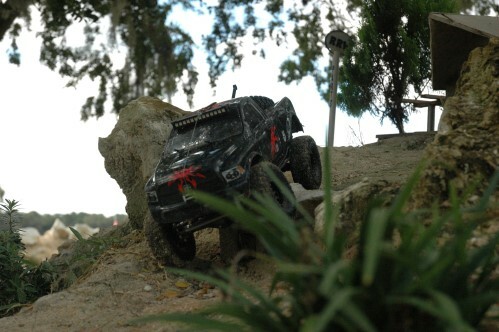 The shocks I used are HPI Wheely King aluminum upgrade pieces. 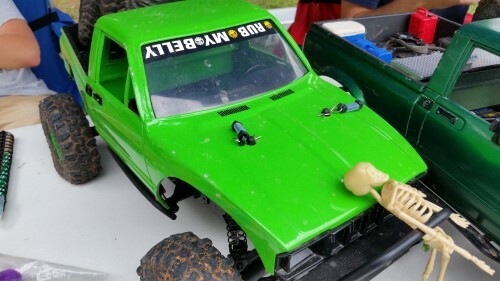 I removed the purple anodizing to make them better fit the look of the rest of truck and filled the shocks with 30-weight shock fluid after rebuilding them using Team Associated Green Slime on the O-rings. I also installed limiters under the pistons to decrease the extended length of the shocks and lower the truck a fairly low race-ready stance. 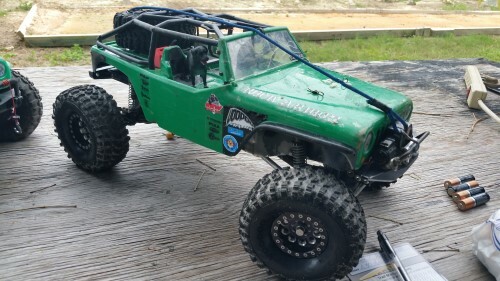 I used Axial shock bushings for the top mounts and trimmed (narrowed) the shocks lower plastic balls to allow them to fit in the AR60 lower shock and link mounts. 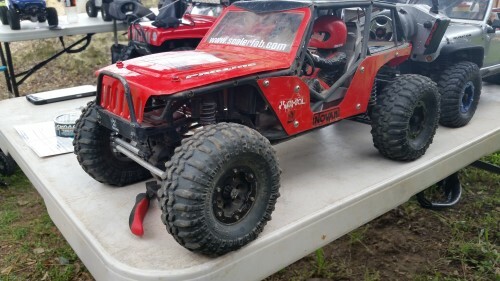 I used Axial’s aluminum lower link and shock mounts because they offer more adjustability with three holes for the shocks and three holes for the links. 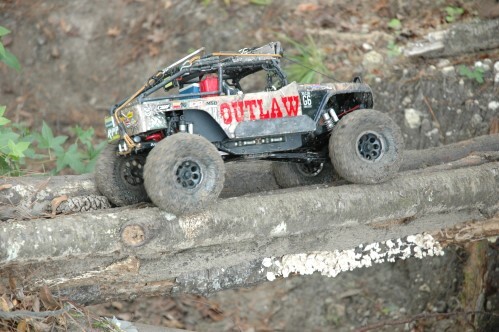 Most monster trucks benefit from sway bars, but they are absolutely essential on a shaft driven monster truck. I bent and cut music wire in a variety of thicknesses. The music wire is attached to the lower links with cable ties. 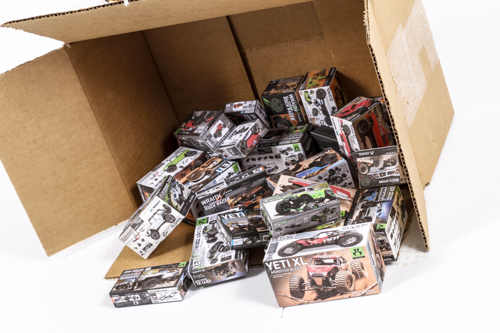 This is how many people add sway bars to trucks like the Wheely King and is similar to the factory sway bars on Tamiya’s TXT-1. 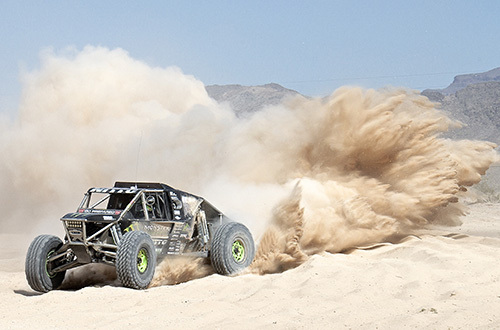 The only things Clod Buster about most racing Clods are the axles. 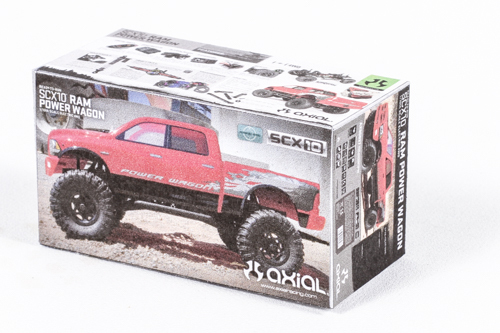 While the motor-on-axle (MOA) design of the Clod Buster axles have the huge advantage of no torque twist, the axles were never intended for competitive use. 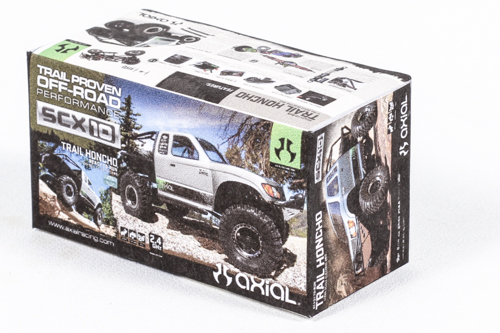 The Axial AR60 axles have many of their own advantages. There is no denying that shaft driven trucks are plagued by torque twist, but it can be tamed and in the case of the AR60 axles, I strongly believe the pros outweigh the solitary con. 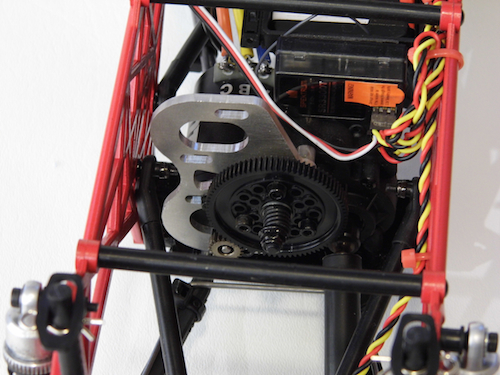 I installed Axial EXO differential parts (Thank you, Axial) to replace the stock locked differentials. 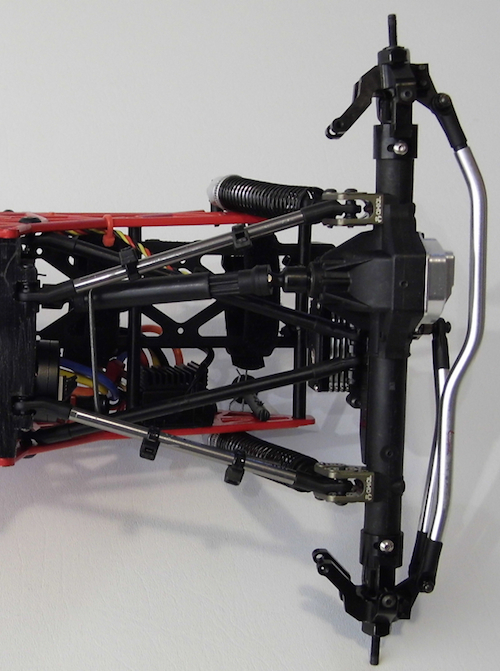 I did this because I preferred actual differentials for this application, but also because No Limit RC–one of the sanctioning bodies I will be racing in–requires front and rear differentials. I have started with simple black grease in the diffs, but thicker grease or silicone fluid is a possibility. 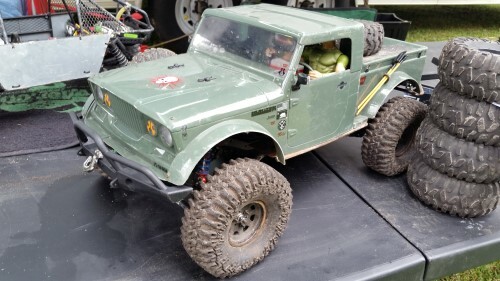 I installed Axial’s heavy duty bevel gear sets, front and rear, and I took advantage of the fact that I could run different gear ratios in each axle. 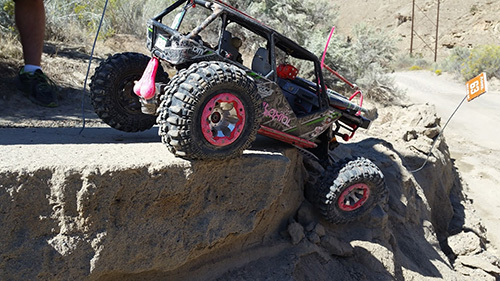 Using an under drive (43T/13T) gear set in the rear axle and the stock ratio (38 to 13) is a common trick used in rock crawling to control torque twist. 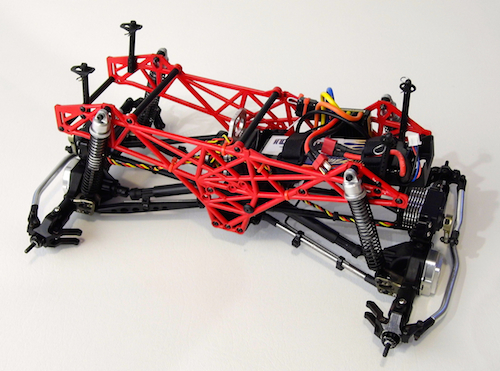 While the AR60 axles are wider than most 1/10-scale axles currently being made, I needed a wider stance for racing. 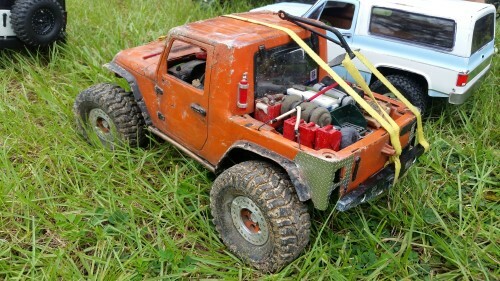 I used RC4WD’s 12mm to 12mm aluminum wideners (Z-S0449). These wideners increase the width on each side 1.25-inches for a total increase of 2.5-inches. 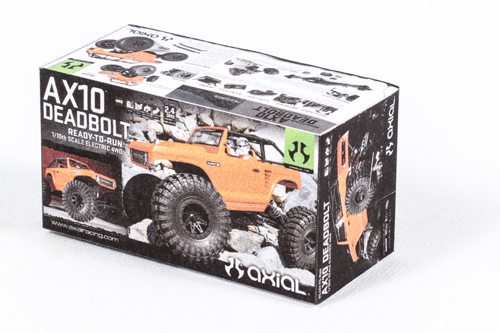 There are a number of manufacturers that offer aftermarket parts for the Axial AR60 axles (Axial included). One of my favorites is STRC. The reason I like STRC is they make a wide variety of direct fit aluminum parts with a quality finish, and best of all, the parts are durable. 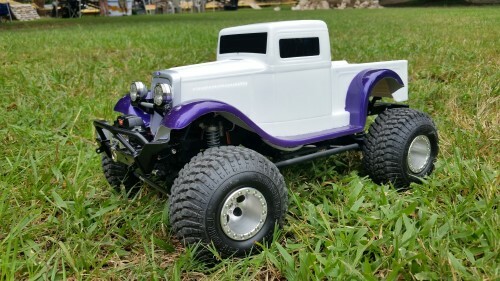 Since the axles take a real beating on a truck like this and because I wanted rear steer, I upgraded the axle C’s and knuckles with STRC’s aluminum pieces. I also replaced the plastic diff cup retainers and diff covers. My upgrades didn’t end there. 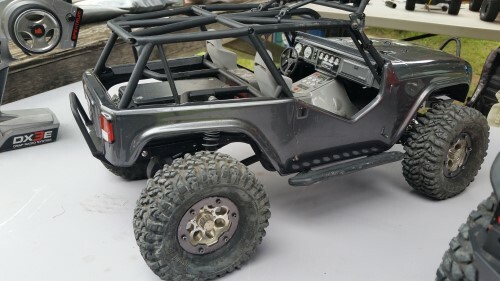 I added STRC’s upper link mounts and aluminum steering links. 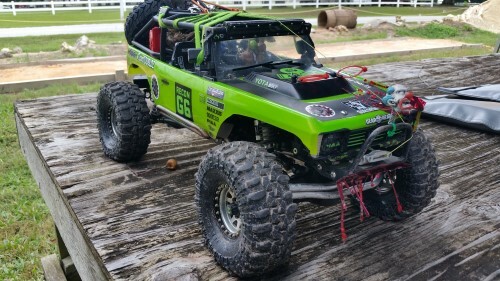 In RC racing, I often preach that tires are the single most important part of setup, so why would a monster truck built for racing be any different? 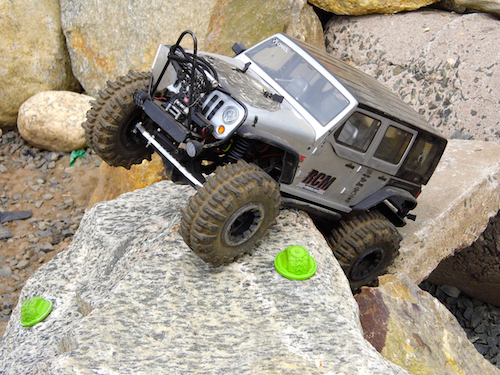 To get improved traction over the stock rubber, I selected RC4WD Rumble tires (Z-T0015). These are direct a fit on the odd ball sized Clod Buster rims. The Rumble tires look like shaved full-size monster truck tires in that the backside of each lug have been removed. 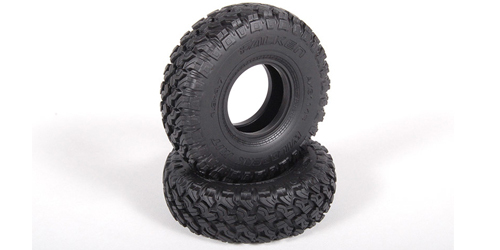 The compound is significantly softer than stock, and the tires include foam inserts. Even though the Clod rims have vent holes, I added three small additional holes to the tires. 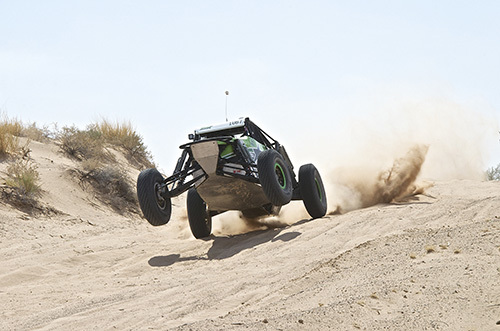 The goal is to allow the tires to compress and distort when landing or cornering without causing bounce or not returning to their proper shape immediately. 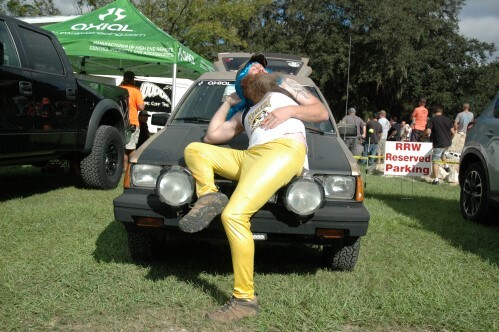 Traditional thought is that looks don’t matter in racing, but you better believe appearances matter in monster trucks. 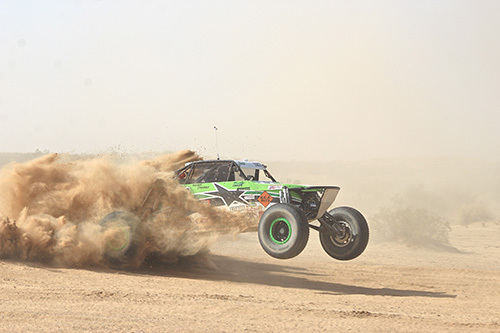 Looks may never win a race, but the body on a monster truck is its personality–the basis of its persona. 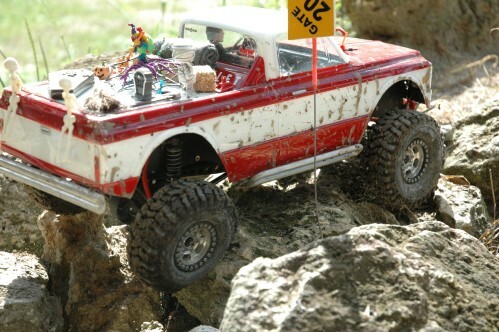 I envisioned a truck that looked bad to the bone, but wasn’t a dime a dozen like RC Grave Diggers. And, I wanted to avoid a typical pick-up truck body, so I selected the ’55 Bomber body (182) from McAllister Racing. 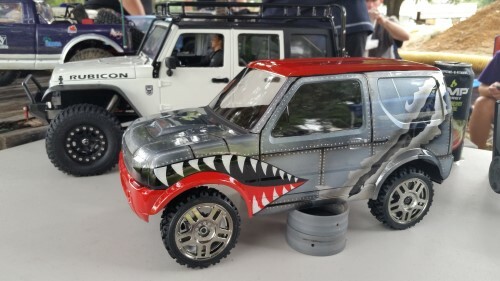 This gives my truck the styling of the popular Advance Auto Parts Monster Jam Avenger truck, but the simple black paint job sets it apart. 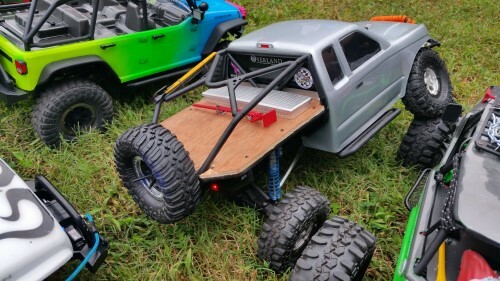 The McAllister ’55 Bomber body is a little wide, but is otherwise perfect for this application. 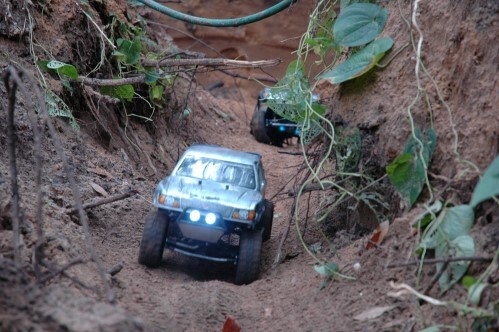 As much as I personally love solid axle monster trucks, the reality is that this segment isn’t short course racing. 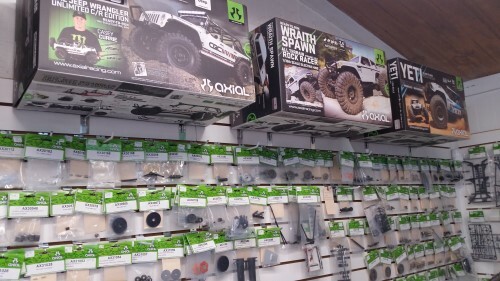 What I mean is there isn’t a race class at every hobby shop. So, I have to go where the racing is and play by their rules. And, that’s where it gets complicated. 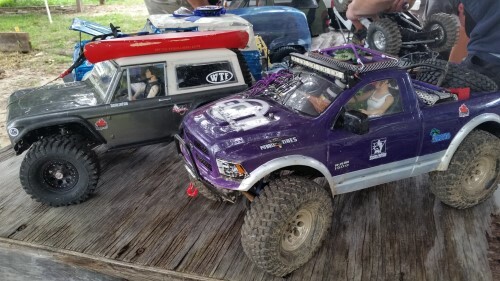 To maximize my potential racing opportunities, I designed this truck to be able to compete in No Limit RC competition and at RC Monster Truck Race Series (RCMTRS) races. 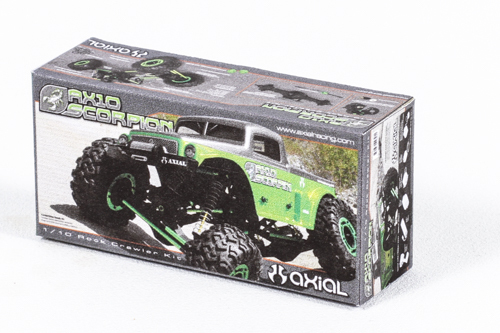 Both series require 2.6-inch Clod rims, but the similarities between the rules pretty much end there. 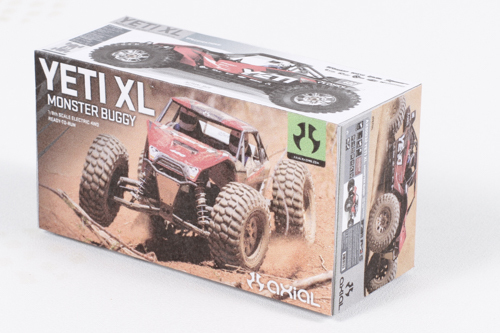 Ironically befitting the name, No Limit RC has no wheelbase or track width limitations. 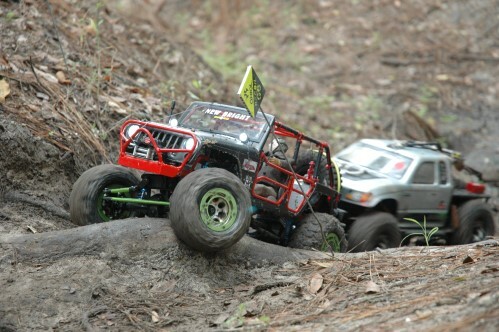 In contrast, RCMTRS limits wheelbase to 14″. 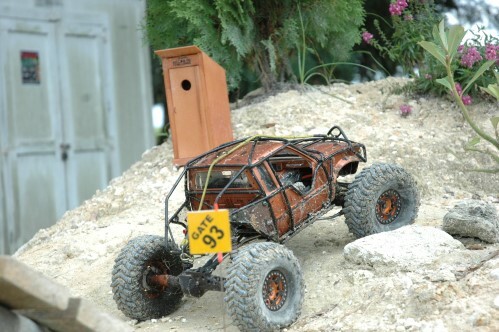 For now, I’m sticking with a 13″ wheelbase but may change to 14″. More on that later. 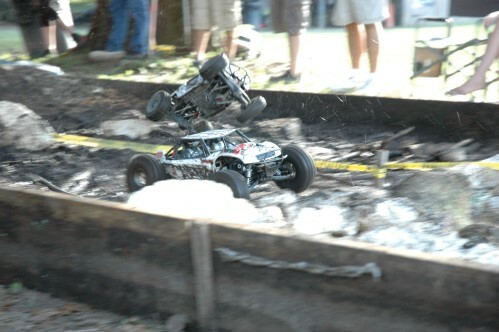 The biggest dilemma I faced was that No Limit RC requires dual motors and RCMTRS does not. I’m not a big fan of running two motors when one can get the job done, but I needed to be able to comply when needed. 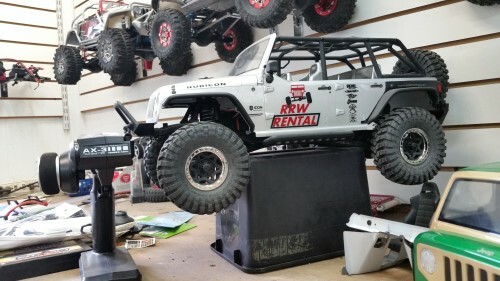 I installed Level3-RC dual motor mount for the Axial transmission. 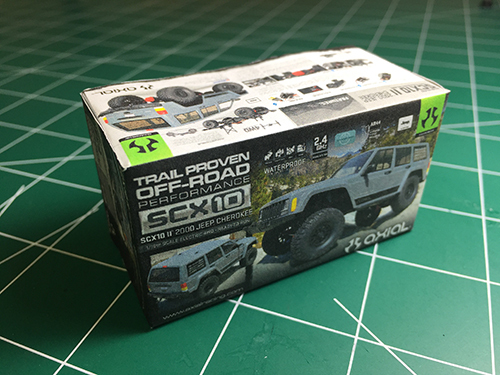 Level3-RC makes two versions, and I selected the one that positions the motors one on top of the other because it makes for the most compact arrangement. After an initial round of testing, it was clear I needed to go with a sensored brushless system for my single motor setup. 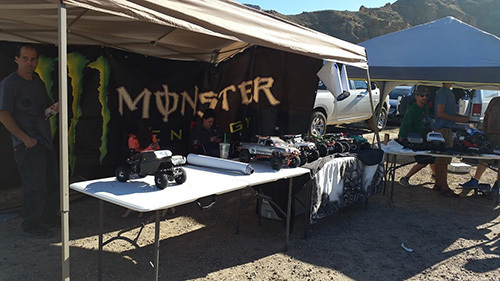 The local RCMTRS affiliated club, RC Monster Truck Challenge of NY, limits motors to 5700Kv and limits the battery to 2S as opposed to no motor limit and a 3S limit outlined by RCMTRS. 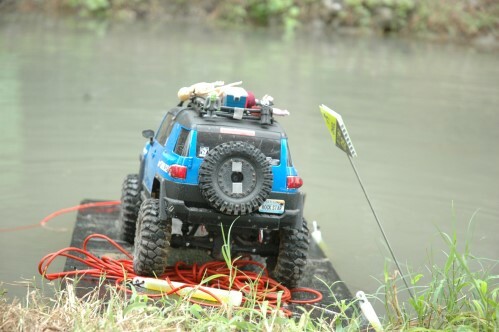 At first I tested with a sensorless 5700Kv 4-pole motor just to push the suspension and general setup. The low speed hesitation (often referred to as cogging) was unbearable, so I installed a Duratrax DE10 speed control (DTXM1300) and a sensored Duratrax 8.5-turn motor (DTXC3425) which is rated for 4450Kv. 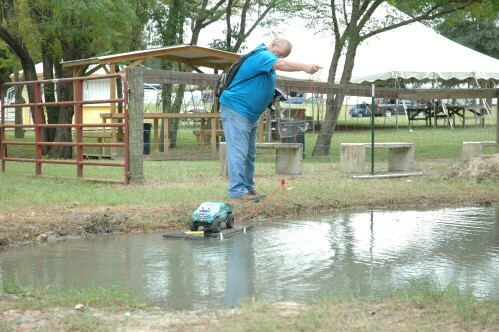 To tap into the full potential of this speed control, I also used Duratrax’s handheld digital programmer (DTXM13500). With 4WS, I needed exceptionally strong servos, so I bolted in Hitec HS-7950TH servos (37950S). 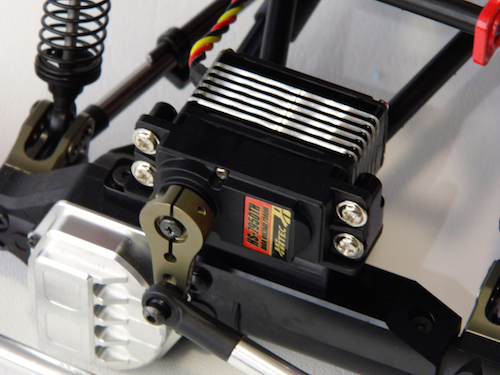 These servos feature coreless motors, titanium gears and deliver 403 oz./in. of torque at 6V and can put out 486 oz./in. 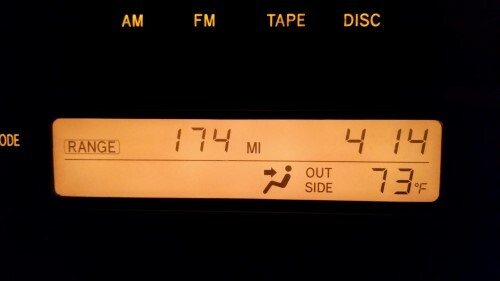 of torque on 7.4V. 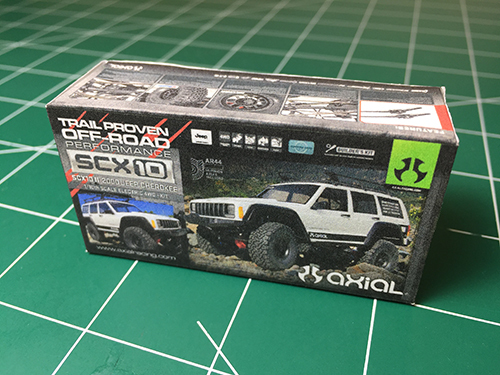 To control the truck, I went with a Spektrum DX3R Pro. 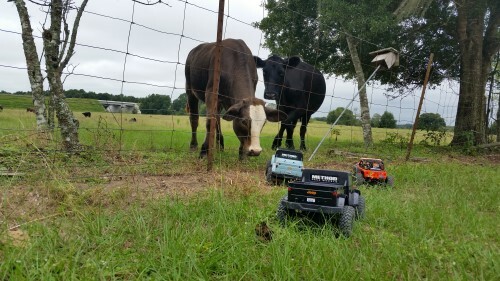 This 3-channel radio is easy to program and allowed me to quickly setup my on-demand rear steer. I programmed Switch B which is normally used for steering trim (moved to switch C) to control my rear steer. 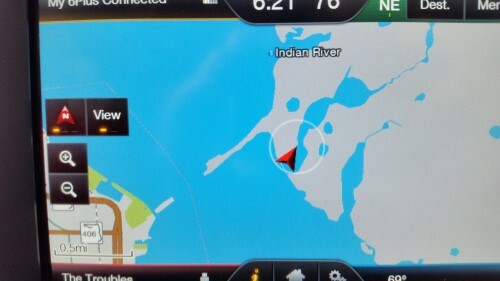 Switch B is easy to reach while driving and I have to set up in such a manner that when turning right I flip it to the right for more steering and vice versa for turning to the left. Because the battery sits high, I am using a MaxAmps.com 3250mAh 2-cell (part no. varies). 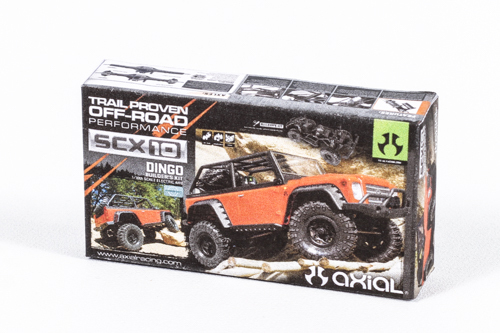 This pack is incredibly thin and lightweight, but will easily keep up with the power needs of the truck and offer plenty of runtime–more than enough considering I’ll be doing side-by-side runs. Since this project is more of a custom creation than, say, a modification of an existing platform, I was exceptionally eager to test it. While the concept seemed sound in my head, there were no guarantees that it would even work. My first tests quickly proved that my fear of torque twist was very real. Adding sway bars, as planned, immediately helped, but were not enough. I even doubled up the rear sway bars at one point. I also experimented with extremely stiff spring setup on the right rear and left front shocks. While stiff springs can be used to tame the torque twist, jump handling is diminished too much for this to be a viable solution. 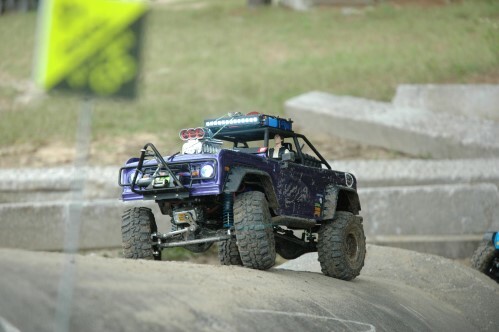 Ultimately, I installed the under drive gears in the rear axle and switching to the milder Kv motor. 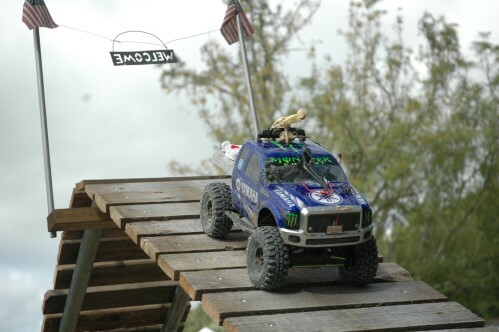 With the rear axle geared lower than the front and the slightly lower Kv motor (also less torquey 2-pole), the truck was pretty close to dialed. 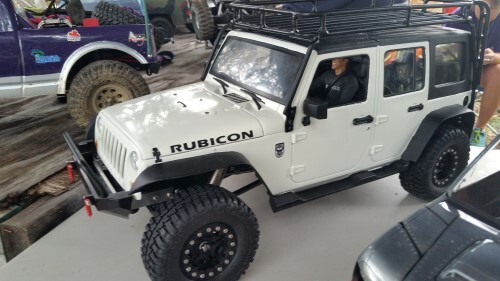 Thicker sway bars are needed and in the works. I simply underestimated how thick the wire needs to be to control torque twist at launch. 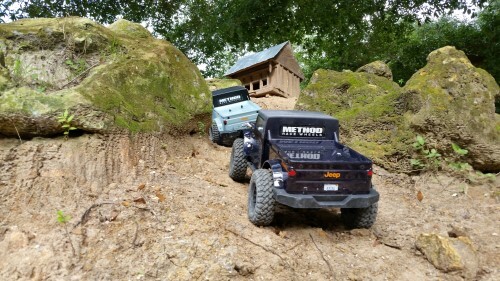 Further testing included a short run on carpet at Pin Shop Hobbies in Oakville, CT. My impression of the truck on carpet is that it handled extremely well, but covers a lot of ground quickly. Quickly enough to make me nervous. I didn’t hit anything too hard, but I now know what the full-size drivers feel like when racing in the small arenas. 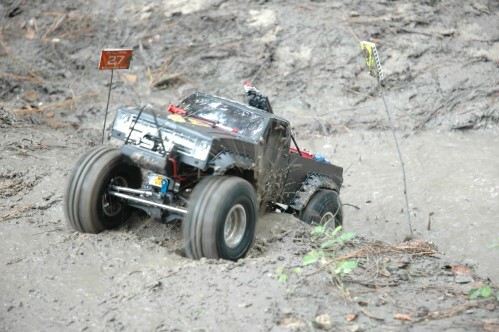 While not every carpet track is the same, I was surprised how well the truck rotated on the fuzzy stuff. 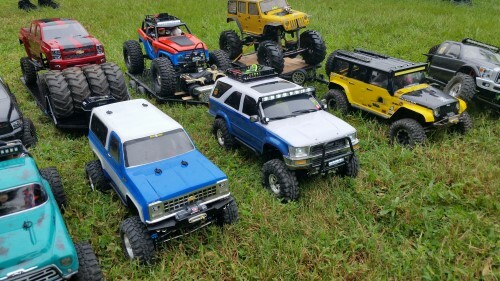 My first real test that featured some competition took place at a Touch-A-Truck event that the Eastcoast RC Trucks club was participating in. 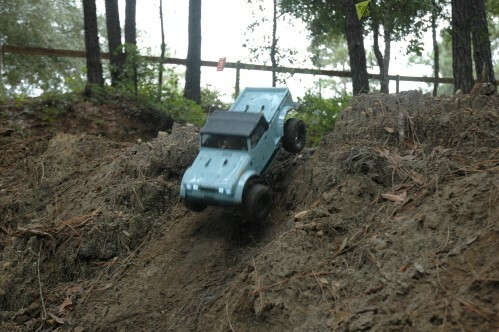 In addition to demonstrating the truck, I raced it on the club’s timed course. 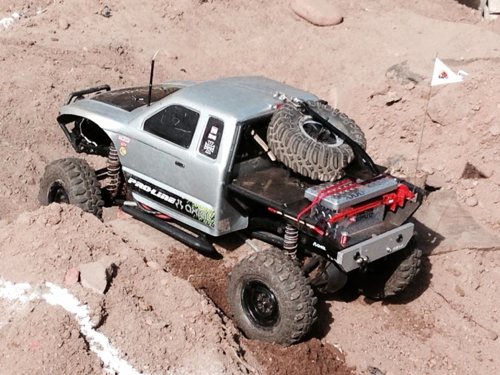 Even while running at a fairly conservative pace, I was happy with how competitively the truck performed. My times were among the fastest recorded and I wasn’t running all out. After the timed runs (I ran two official runs to settle a tie-breaker), I started to get braver with my freestyle antics. 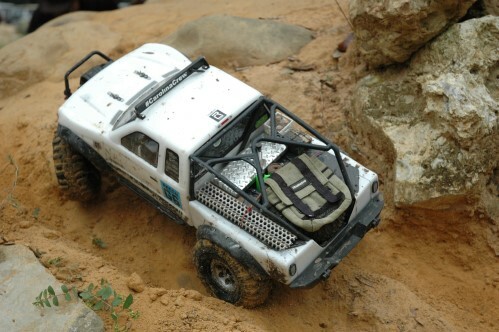 The truck jumps great and responds extremely well to throttle inputs. It also recovers well from less than perfect landings. 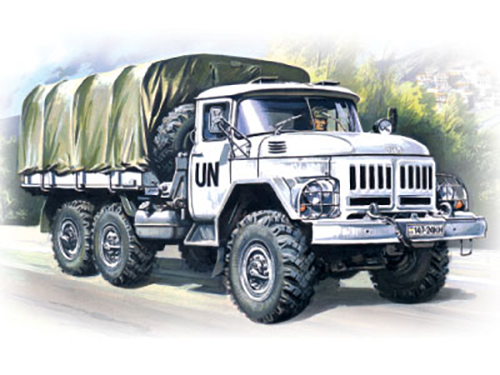 If you’ve ever driven or seen a truck like this run, you know how much fun watching one handle like the real trucks. Only once during my day of time trials and freestyle, did I encounter any sort of breakdown. 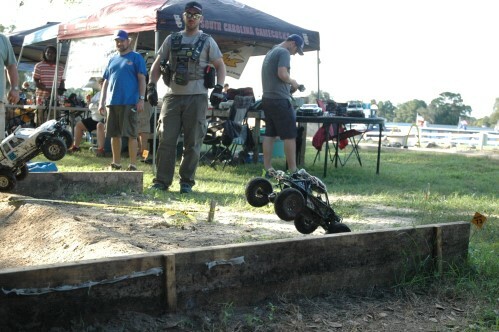 A particularly nasty end-over-end landing popped the front steering link off. I snapped the rod end back in place, made a mental note to add a washer as a retainer and was back on my way. But, speaking of breaking stuff, previous to the Touch-A-Truck, I did have some minor parts carnage. The early victims were the body mounts. Even though the body mounts are fairly short, the thinner 1/10-scale touring car style ones I first tried pretty much instantly broke. So far, the slightly beefier replacements have held up, but I’ll be watching them and thinking of an even stronger solution. I also broke the original Clod Buster rims–all four. I have no idea how old these rims were, but they didn’t last too long. 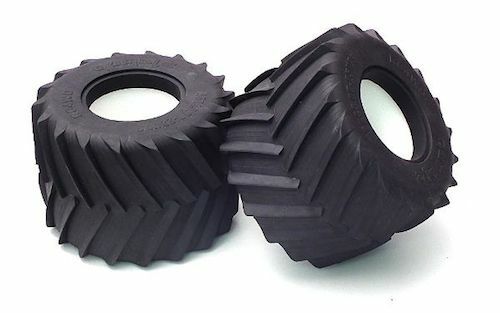 Pin Shop Hobbies came to the rescue with a set of new Clod Buster rims from Tamiya. The “un-aged” ABS have worked out great and withstood all sorts of abuse. 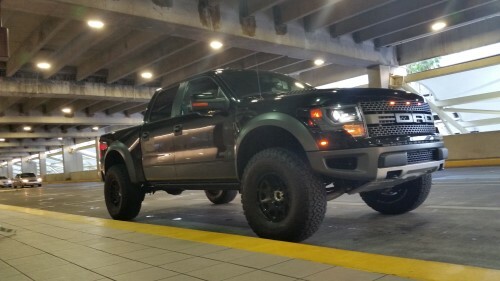 The best way to describe the overall experience of driving this truck is that it’s fun. 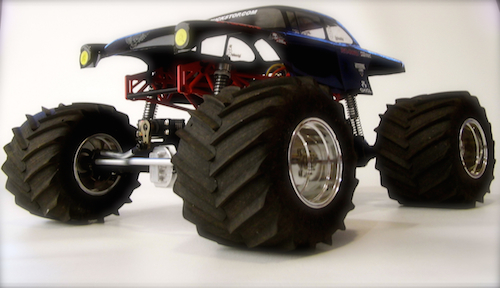 I know that’s vague, so to be more specific, it drives, reacts and generally behaves like a real monster truck. 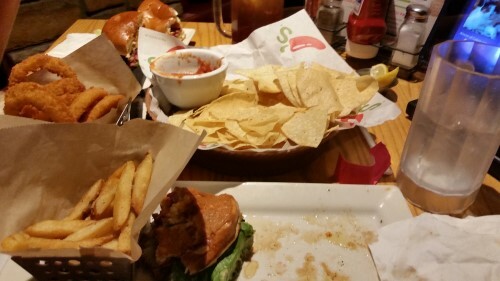 All of that makes it–a lot of fun. It’s a handful off the line when too aggressive with the throttle, but I’m working on that. As described above, jumping is a blast. Hit a jump square and it flies perfect, is easy to control and lands on all four without even the slightest bounce. Fly through the air crooked and it’s even more fun as you land one wheel first, bounce the front up and power out like the real deal. Unlike most race Clods, this truck has rear steer. The rear steer adds to the fun, but I have to admit I largely ignore it even though I have the rear steer throw turned down to less 25% of the front steering. I’d have to get tons of wheel time and develop some real synergy with the truck to use it in racing, but it rocks in freestyle type use. 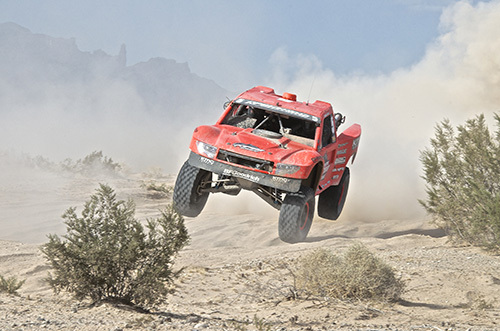 While the testing will continue and I will certainly learn even more when I race it side by side with other trucks, I can say I am highly satisfied with the truck thus far. 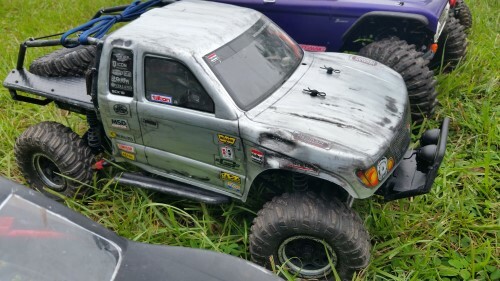 At this early stage, it isn’t perfect, but this truck clearly has potential to be a legit racer. 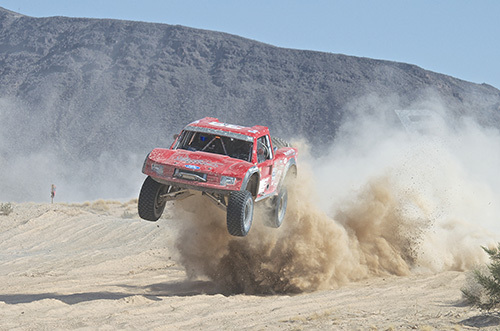 While I’m sure there will be changes that I can’t predict as getting more real racing experience with the truck will show what needs to be done–or not done. I do hope to have a skid plate professionally machined. I would also love to have new side plates cut out of G10 fiberglass. My design for the fiberglass side plates would mimic a tube frame and the look of Wheely King plates, but will have more tuning options for the upper shock mounts and upper link mounts. Even better, it will be more durable. 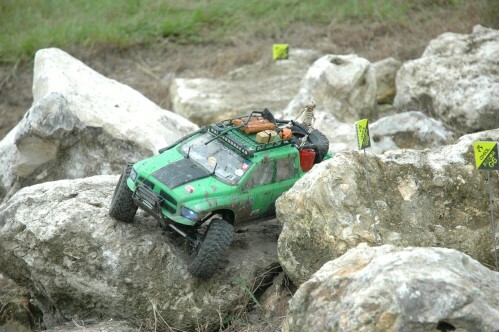 I also plan to cut down the lugs of the RC4WD tires and balance the tire and rim setup. 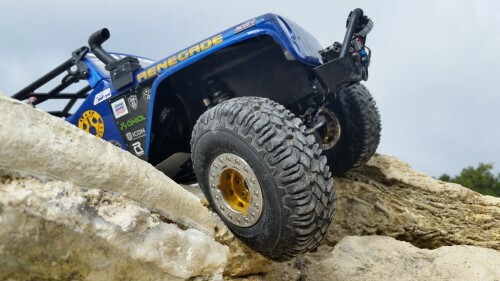 While these tires are proven to be exceptional thus far, I would like to also try Imex’s Baja tires for the Clod Buster rims. 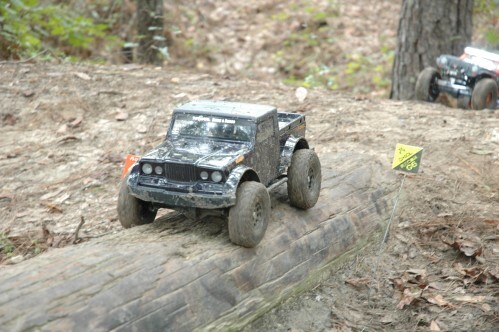 The one item I am on the fence on is the rear axle and whether to keep the rear steer or go with a straight axle. On testing and experimentation will reveal which is best. I have lightheartedly dubbed this project the Clod Killer or CK-1 as it’s the first version. 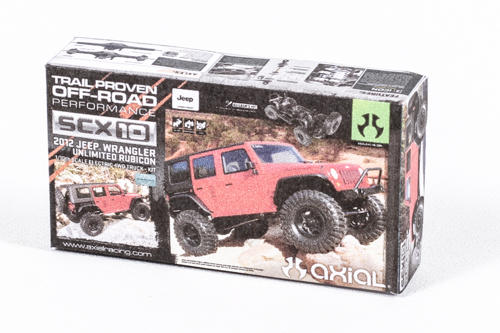 Maybe CK-2 will be based on the Axial XR10 if I can talk someone into making a differential for the axle. 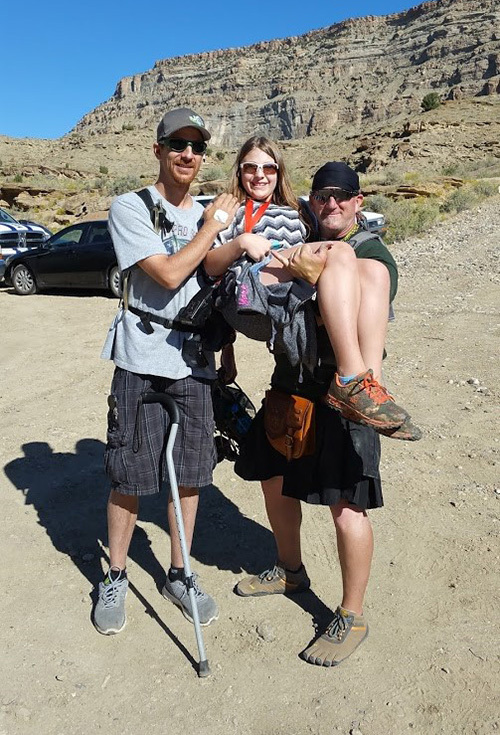 Grand Junction, Colorado could be one of the best places that you have never heard of. 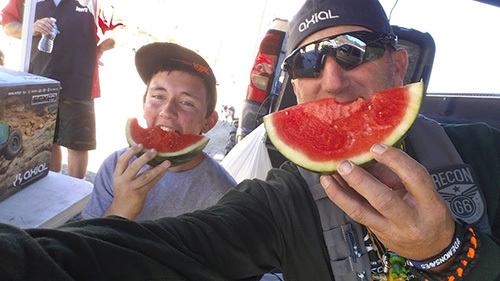 After all, it is nestled amongst some big names in outdoor adventure; Moab, Utah, Durango, Colorado, and Aspen, Colorado. 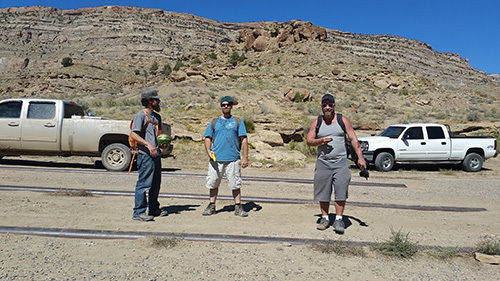 It’s easy to fall in the shadow of those mecca adventure locations, but Grand Junction, is just that, a Junction of Grand adventure. 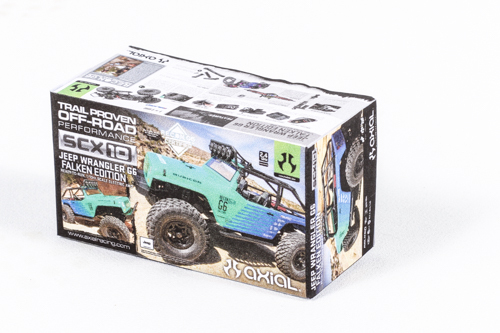 The drivers of an Axial RECON G6 scale adventure event are true adventurists who like to have fun and enjoy being outdoors and all the challenging fun that a RECON G6 provides. 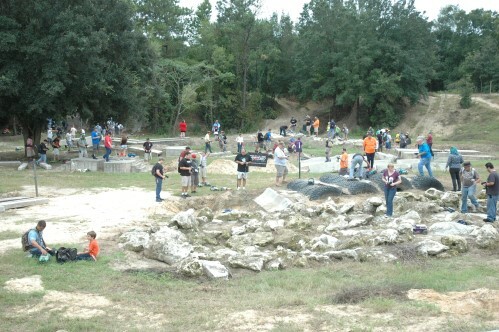 Here is a look at some of their pits. 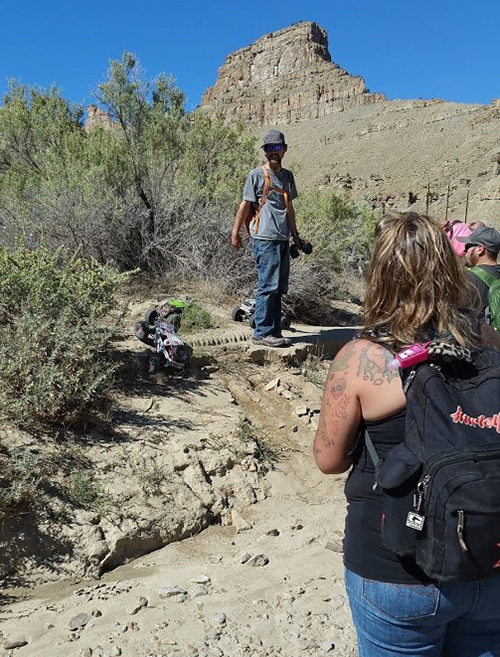 There is always some great trail action at an Axial RECON G6 scale adventure event, but G Central was moving and grooving with G6ers having to dance like Kokopelli and play the fruit that each driver brought like a flute to gain access to the special Kokopelli section of the stage. I appreciate the help from volunteer G Crew Members. We have waaaay to much fun. 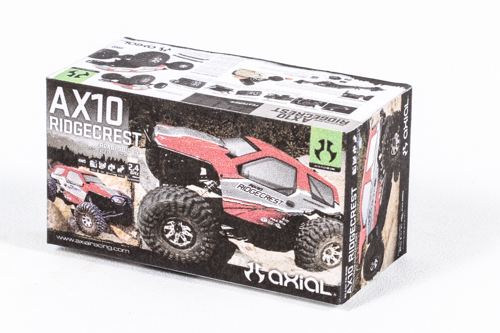 Thank You to those that helped with the Axial Kokopelli RECON G6. Each RECON G6 means something special and different to each driver. 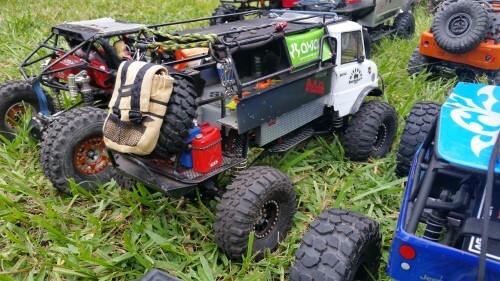 I was moved by this Axial EXO Terra Buggy. 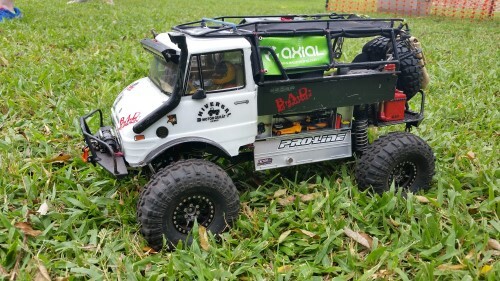 The original owner passed away and several drivers of the rc club, finished his build and drove it in the Axial Kokopelli RECON G6. 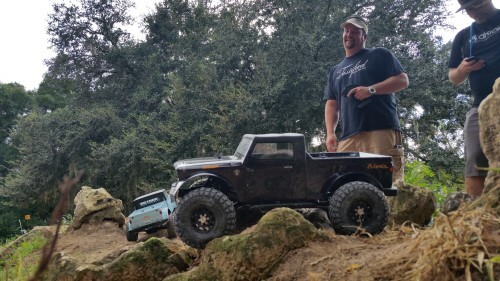 I know he was smiling in watching his rig being driven by such a great friend. 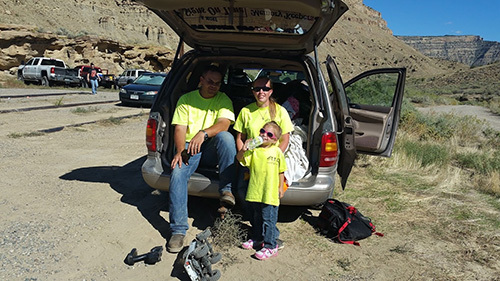 Thanks to everyone who came out & enjoyed all the adventure that Grand Junction, Colorado provided! 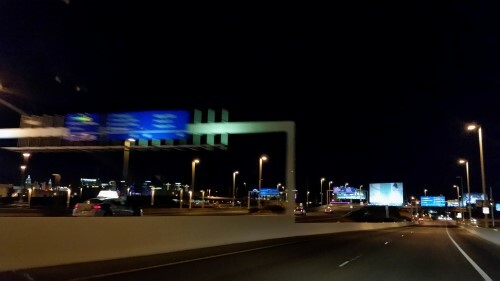 It is 4:14 a.m. here in Las Vegas and I have a 6:05 departure time. So as you can probably guess, I am running late. 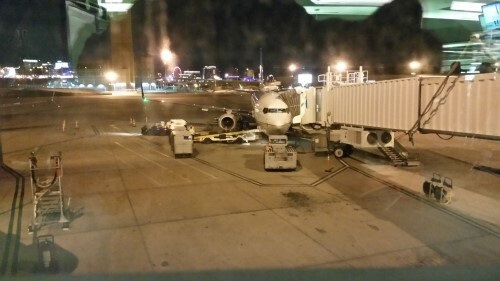 McCarran International Airport is usually pretty busy so I am a bit worried. 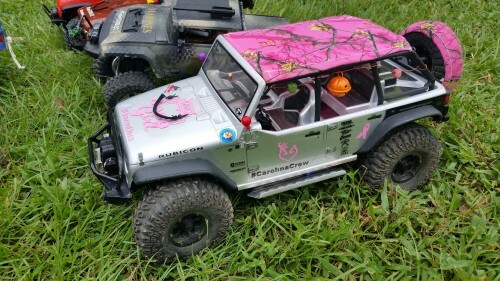 Orlando Florida is my destination for the Killer Clowns Axial RECON G6. Dominic and I are cutting through the darkness in a hurry so I don’t miss my flight. 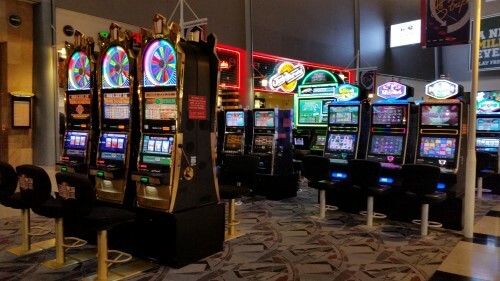 I am not sure how many airports have slot machines in them, but here in Las Vegas I believe they are almost everywhere. Whew! 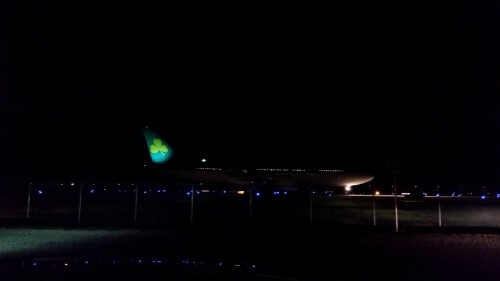 I barely made it, I have about 4 minutes to spare so I was able to take a pic of the plane. 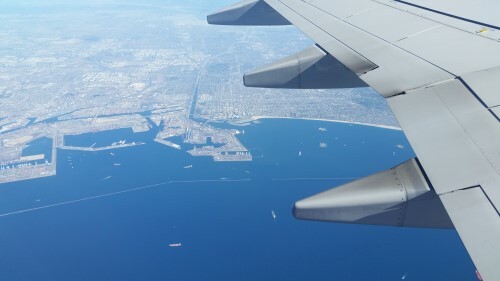 I am flying to LAX for a brief layover. 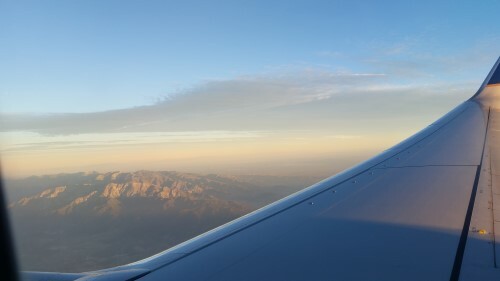 I too find it strange I am flying west before starting my journey east. 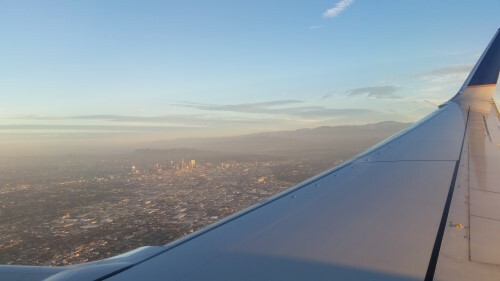 I see a mountain range and before I know it I am seeing Los Angeles. 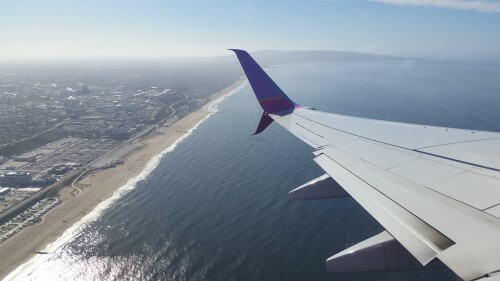 Approximately a 45 minute flight and it felt like less. 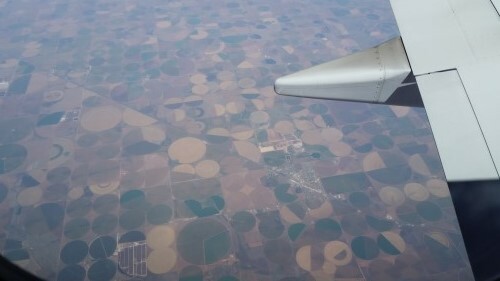 I am guessing this is Texas, I really do not know this to be true. 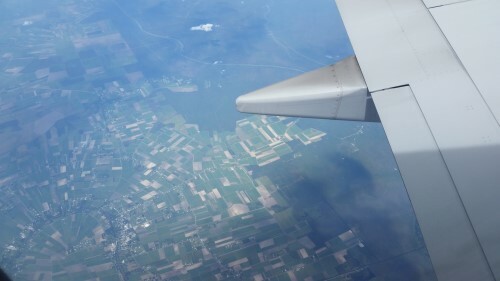 It seems to get noticeably greener the closer I get to my destination. 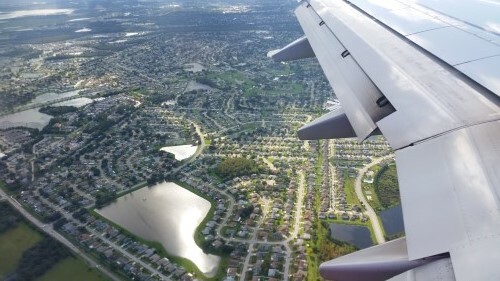 On approach, Florida down below. 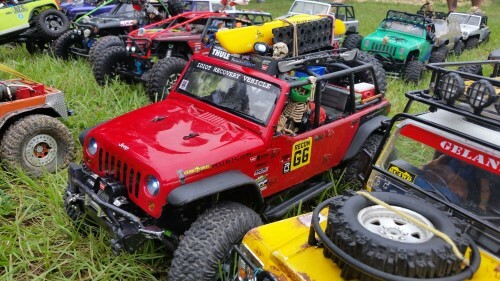 After arriving in Orlando I was greeted by Kha, a fellow off road and RC enthusiast. 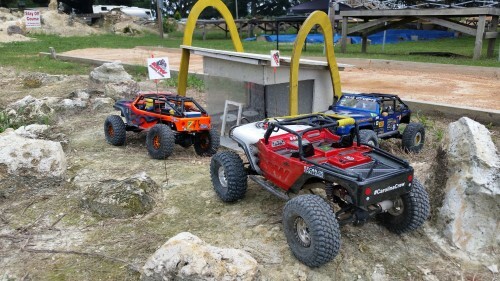 We headed out to grab a quick bite to eat. After killing an hour or two it was back to the airport to pick up Mr. Schultz. 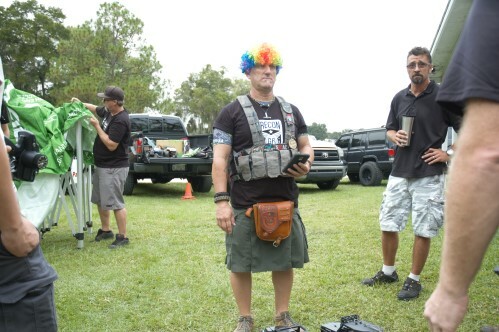 When I head out to an event, like most of you I just try and have some fun. 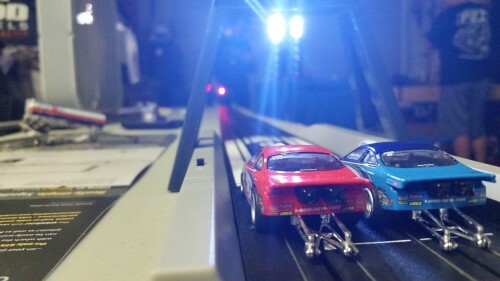 So back at the Khapound we did some slot car racing. The pro tree was a challenge. 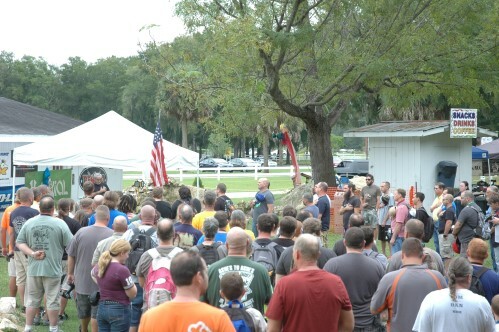 Friday morning we loaded up and headed for RRW Krawl Zone located in Belleview, Florida. It is a day early, but we wanted to check out the location. 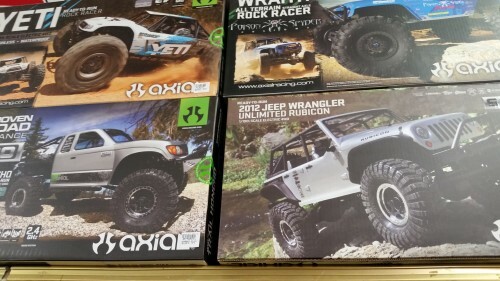 We stopped at a couple of hobby stores that we noticed while driving. 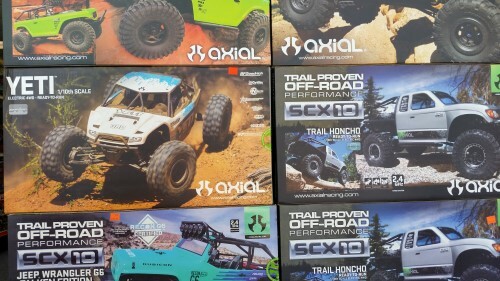 It was nice to see they had these Axial trucks stocked and ready for purchase. 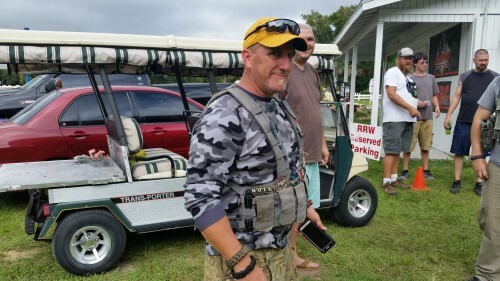 Once we arrived at RRW I saw Parker, the founder and man behind the RECON G6. 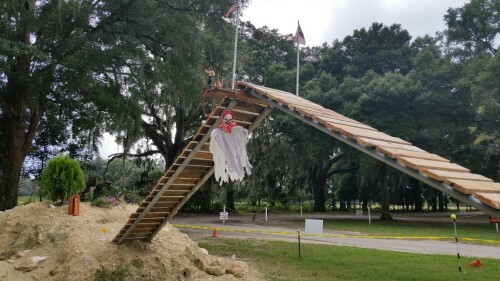 He had already started plotting the course for the Saturday event. 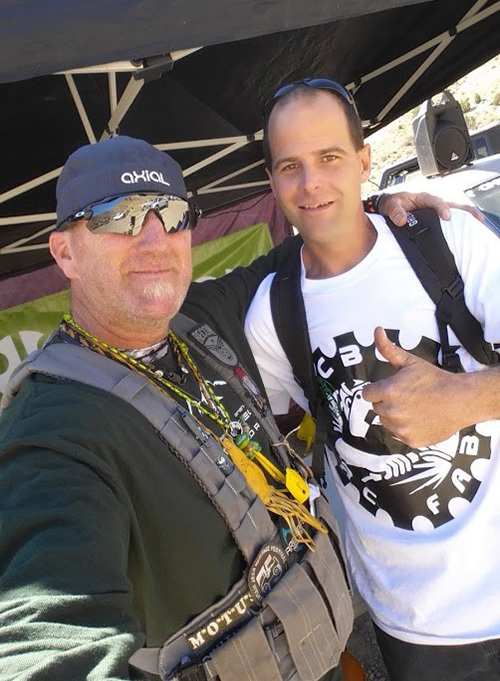 Once gain I ran into Josh Harris, I run into this guy often at events. Shawn Barton was also present, making the drive from South Carolina. Shawn and Parker have a bet going on, over a college football game. The bet is this: If your team loses you have to wear what the other person has brought for you, it will be in the opposing teams color. Parker and his Mizzou Tigers vs Shawn’s SC Gamecocks. This should be interesting. 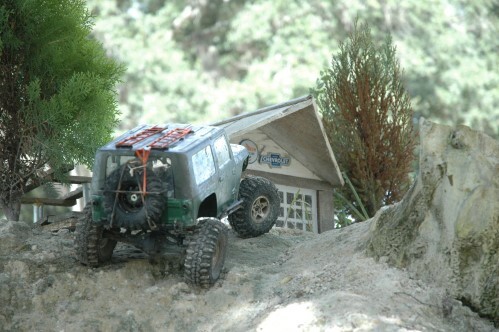 After looking over the outdoor scale course that this hobby store has I headed inside. Plenty of parts and cars in here. 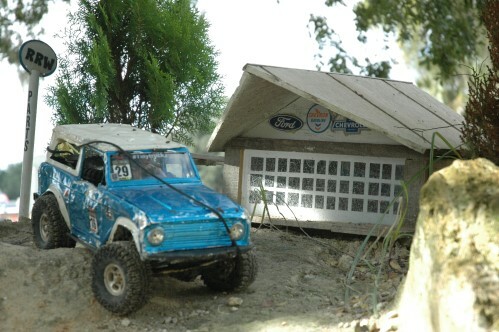 These guys have a collection of cars and they even have rentals for those of you who want to check out the scale course. 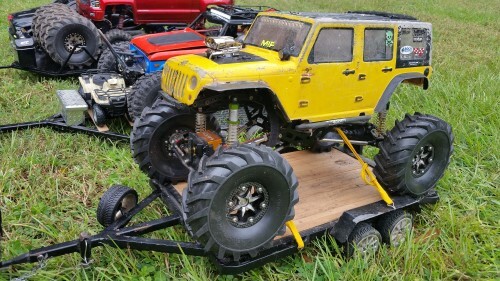 Yes that is a rental Axial Jeep JK. After checking out the shop I headed outside to go drive the scale course with Parker’s permission, because there is no pre-running a G6 course. 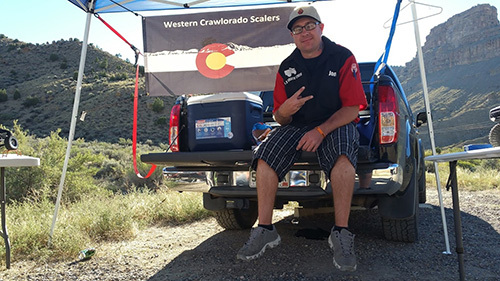 We really had a good time on the scale trails, RRW has put some time and thought into this. Making it a memorable experience for all. Before heading out I ran into this G6 driver who came by to check things out early. This is Brandon Ryan, he had brain cancer removed 3 months prior to this day. 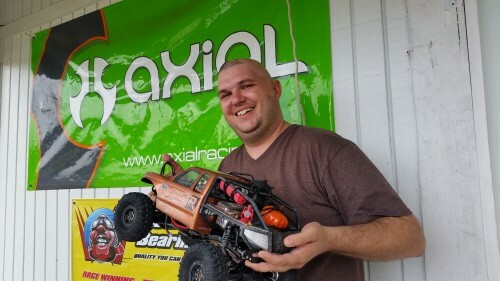 He is happy to be in remission and happy to drive this Axial Honcho in a RECON G6. 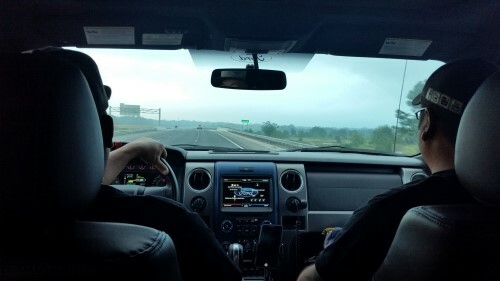 It’s the morning of the G6, from left to right is Schultz, Kha, and Frank. We are scrambling to leave the Khapound and get on the road. 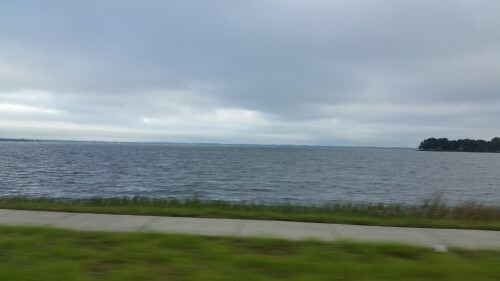 There is a light sprinkle when we start this trip and some dark clouds looming out over the water. 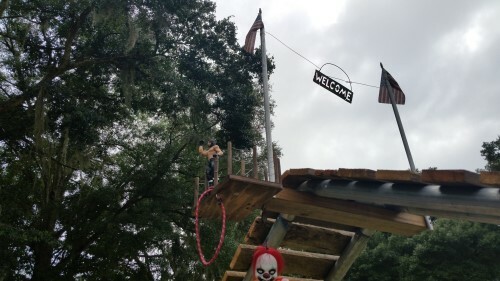 As soon as we turned into the Market of Marion we were greeted by signs, pointing us to the Killer Clowns Axial RECON G6. 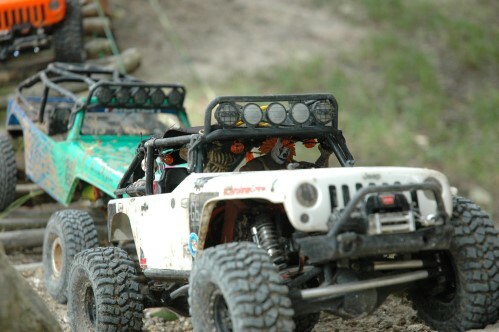 I am eager to go check out all these rigs. It seems common for drivers to bring multiple cars. So I will be wandering around pits and camps to see everything I can. How cool is this? 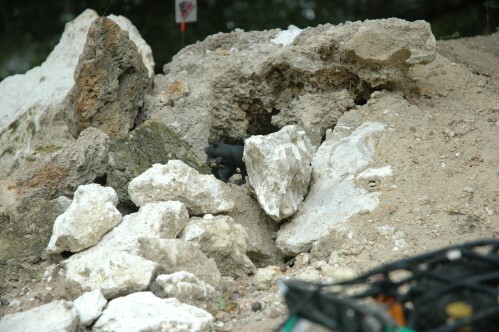 Spotted this over at the GCM camp. 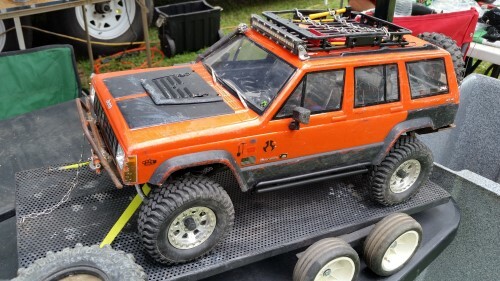 This Axial Wraith was pretty well upgraded. 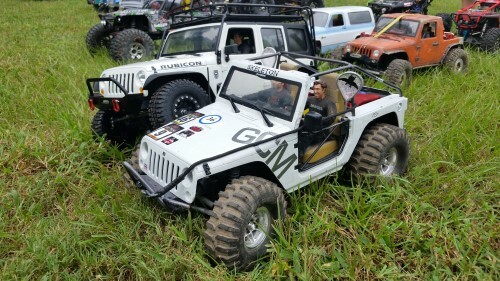 Even the diff covers seemed to fit the theme of this RECON G6. 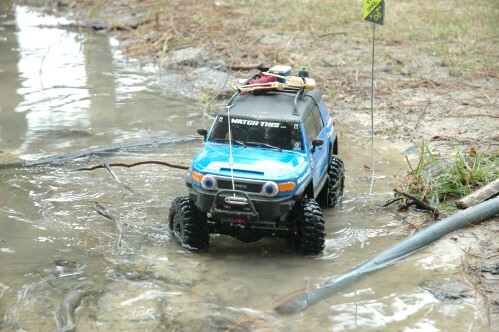 Very cool Marine themed rig on a cut down Axial SCX10 chassis. 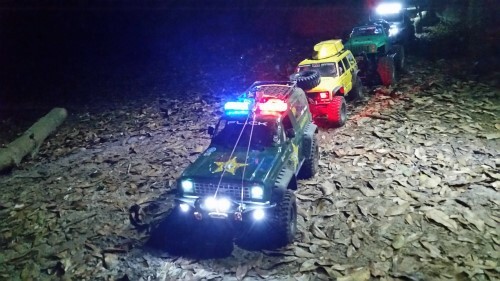 I always see some rigs pushing that next level of building and scale realism. 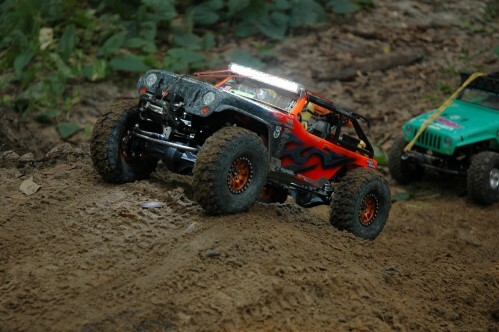 I still say the 1.9 Wraith is gaining popularity in the RC community. Hard bodies were present and built to run on course. 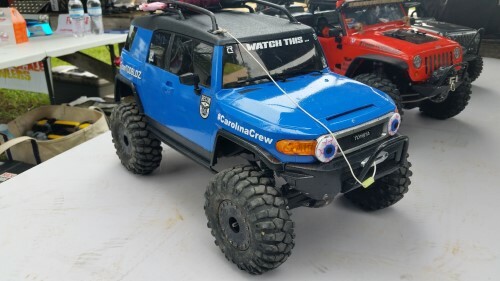 I like this Yota-Bolt, the grill is a nice touch. 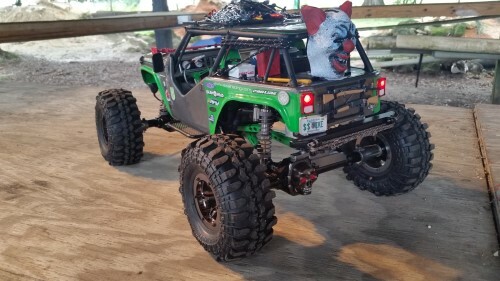 Some of the drivers went so far as to paint on their rigs to fit the Killer Clowns theme. 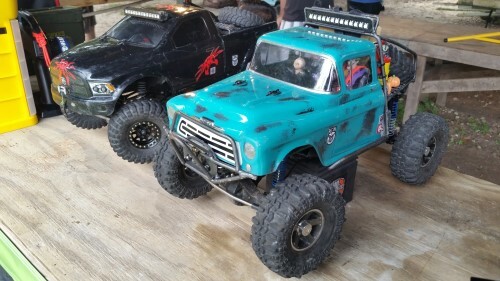 These mud trucks came proper to the Rivas Concepts Show & Shine. 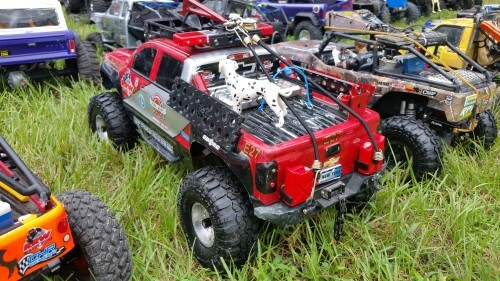 I am still in awe over these rigs. This old school rig has a very unique retro look to it. 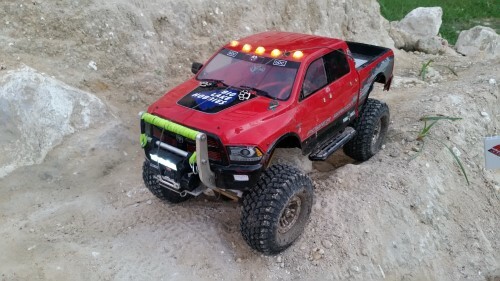 Those custom width Mayhem Engineering beadlocks look good on this build. 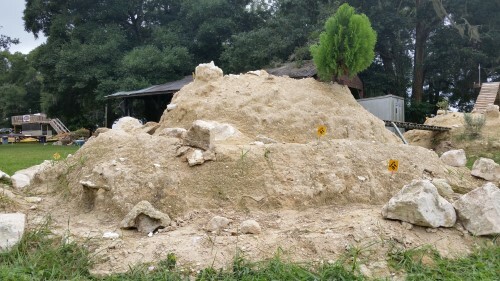 The builder and owner says its not done. 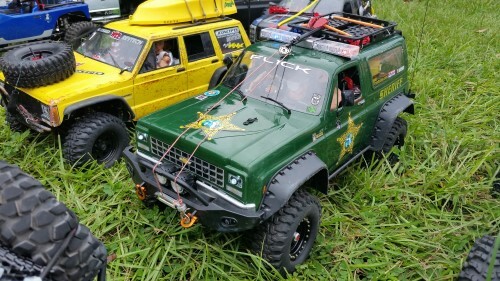 Some Jeep XJ’s on hand here in Florida and looking very scale. Parker greeted everyone at registration and then changed into character to call all the drivers together. 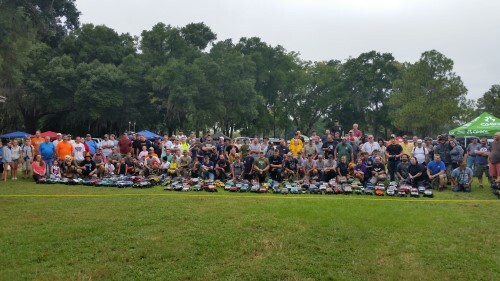 145+ drivers on hand coming from all over Florida, and some from other states. As always the National Anthem precedes the start. 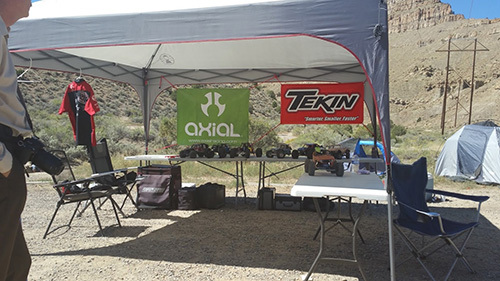 The Killer Clowns Axial RECON G6 is underway and everyone is watching. Once you made the trek from G-Central to the woods it was a completely different feel. Launched about an hour previous to the regular G6, the Endurance class was out on a 6 hour run. 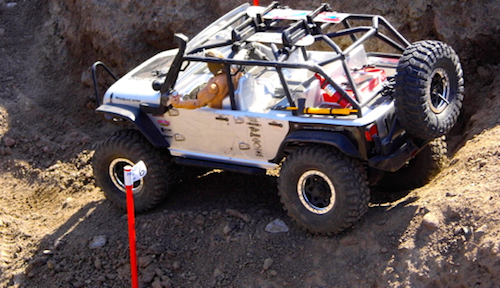 The Axial Jeep G6 pictured above and the Axial Honcho pictured below ran 850 trail markers! Clear dirt was present on this stage. 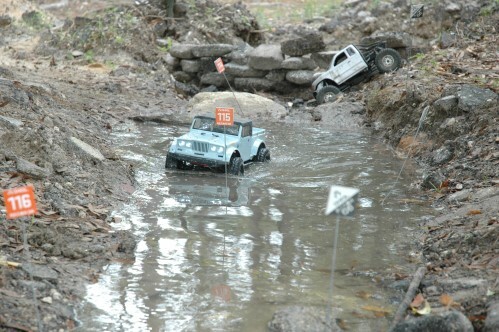 Some action from the RRW scale course. 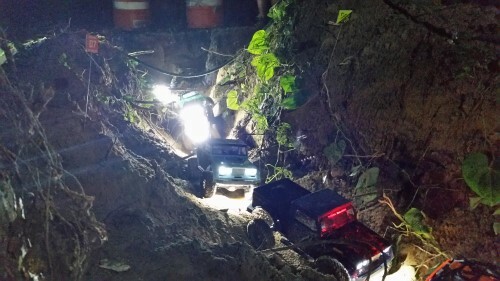 Whether you were driving solo or with a spotter, these guys had a lot of obstacles to negotiate. 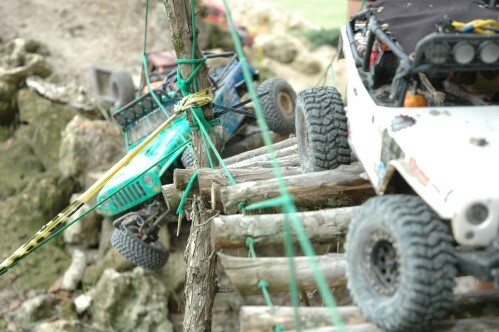 This Jeep with tubed doors broke a rear output shaft early on so his buddies pushed and pulled him through the stage. 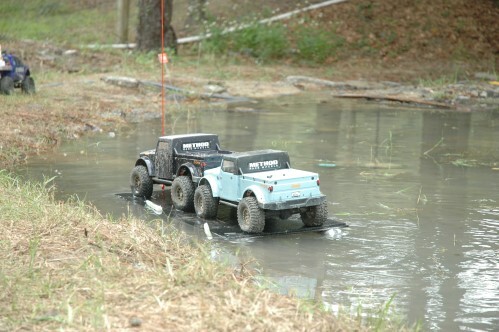 Clear dirt sections ranged from mud, shallow water crossings, to a floating challenge. Yes a floating challenge. 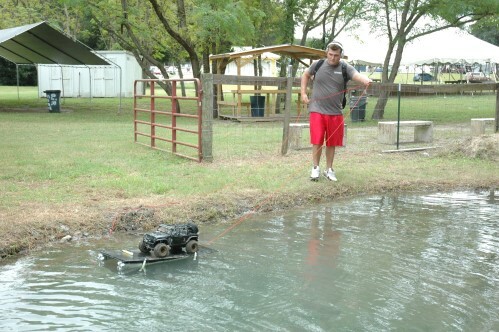 Drive your rig onto a mini barge and pull it across the water. Apply power where needed. 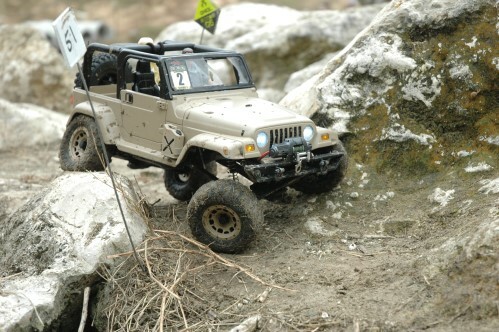 Some spots were just a little to slick to crawl. G6′ers are always encouraged to keep an eye out for stage items. The RRW scale trail even offered some scenery. 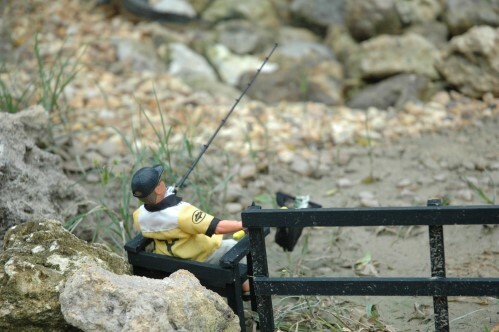 Like these bears and fisherman pictured below. 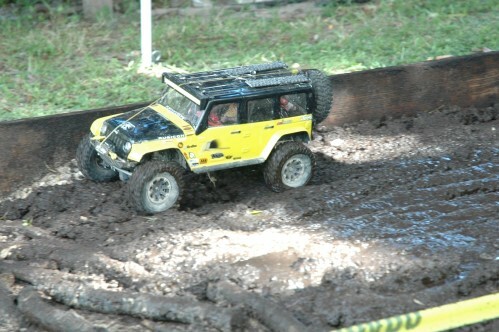 Some 1.55 tires on this Axial Jeep G6 doing work in the slop. Even a little sand for these RECON G6 drivers. 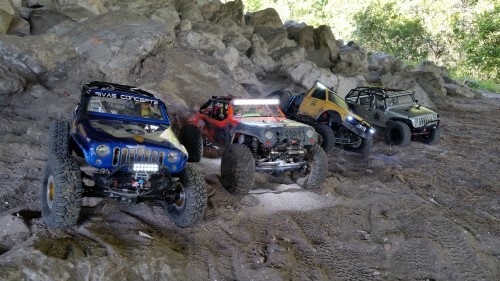 After the 150+ trail markers, it was back to G-Central for some side by side rhythm drags. 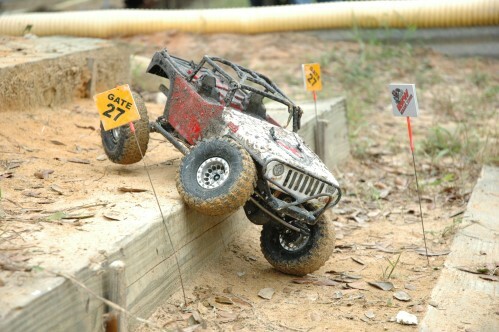 This Axial EXO Terra Buggy was hammered down looking for a win. Some very exciting close side by side action. 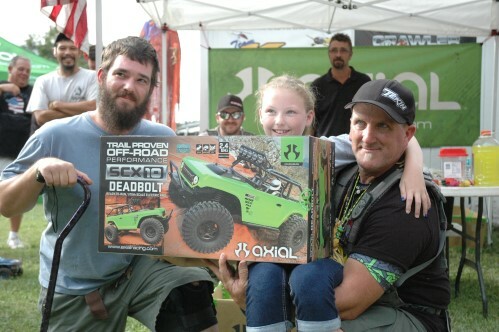 Kaitlyn is 12, a first time G6er and also a raffle prize winner of this Axial Deadbolt. 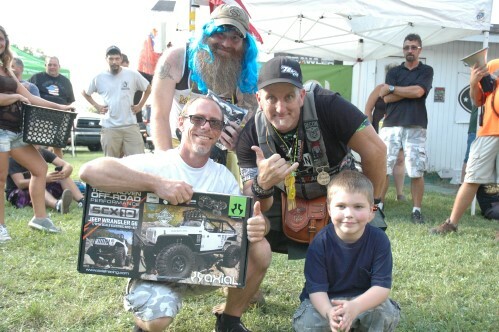 Larry, the man on the left, is no relation, he actually donated this rig to the raffle. Just wanting to see someone happy to win. 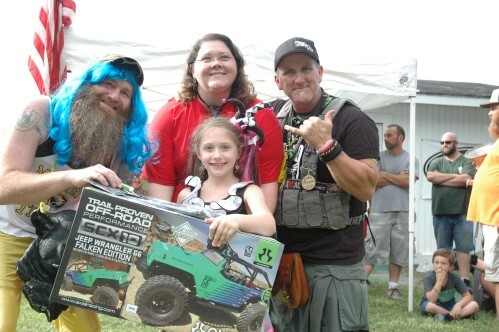 Alexis who is 7, also driving in the RECON Rascals class, claimed her prize with her mom Misty. This is their 2nd RECON G6. 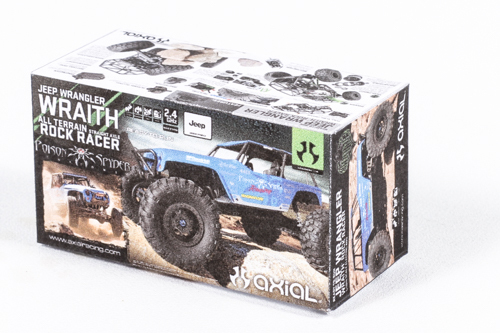 Rylan age 6 was the winner of this Axial Jeep Falken G6 RTR. His dad Ronnie, on the left, was also a driver. 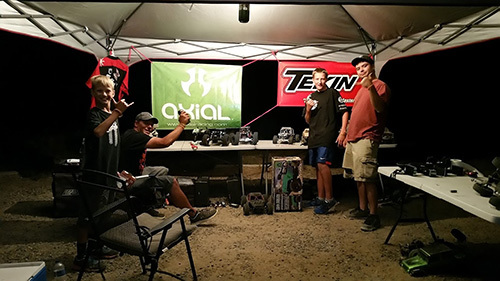 What could be better than your son winning an Axial RTR rig? 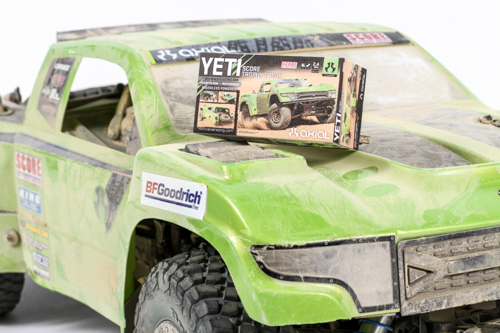 One thing that could make it even better is you winning an Axial G6 Kit! 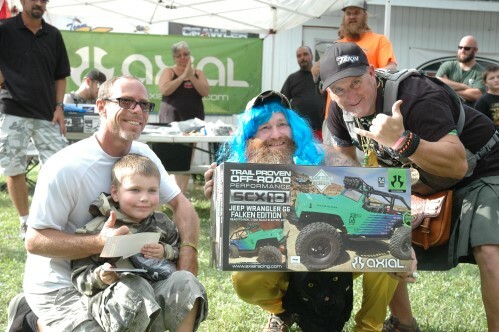 Ronnie and Ryan were very lucky in this raffle. 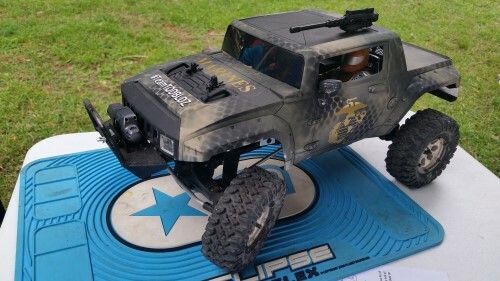 This is now their 3rd Axial RECON G6. Did anybody notice the guy with the blue hair? It’s none other than Shawn Barton sporting some Missouri Tigers colors. Yes his Gamecocks lost, so he lost the bet. He was a very good sport about it. 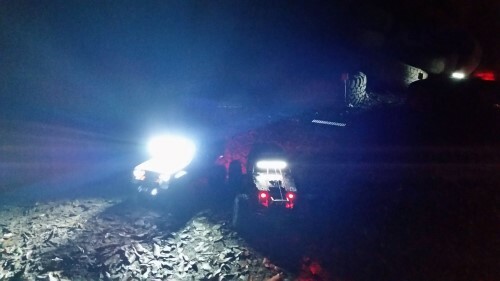 You can start to see the lights better, so that means it’s close to the night stage. 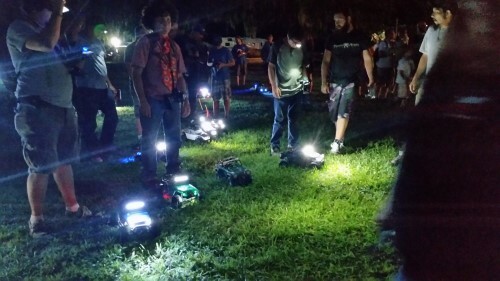 Parker sent them off into the night for yet another adventure. This stage comes to an end. 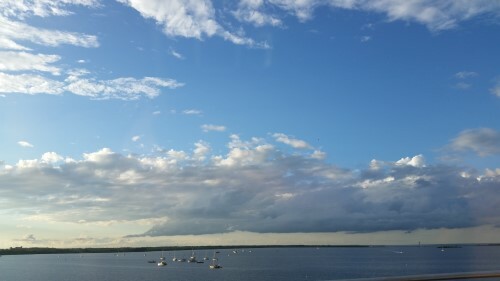 Normally the story ends here, but I have another day here in Florida. 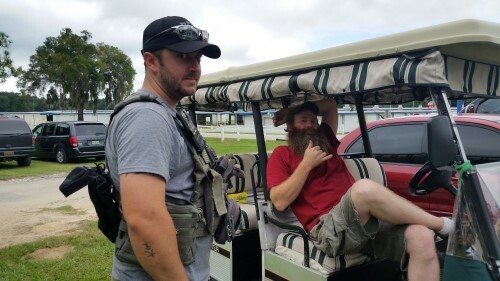 Sunday we went and ran at a spot a few locals know as Sanford. 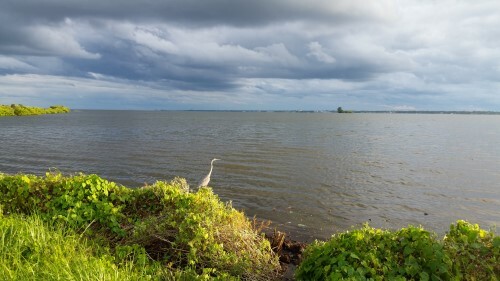 We went out and did some exploring on the waters edge. I was hoping to see a gator. 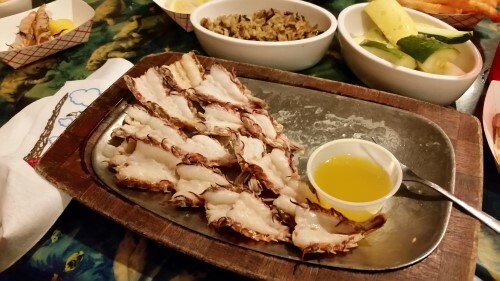 If you ever get the opportunity, I can not recommend Rock Shrimp enough! Wow, broiled was the way to go. Be warned though, regular shrimp will never compare. Great day and great adventure. Thanks Kha for the locals tour and Parker for a great event. 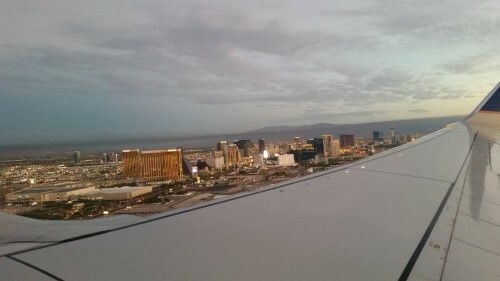 Back to Las Vegas until the next adventure. 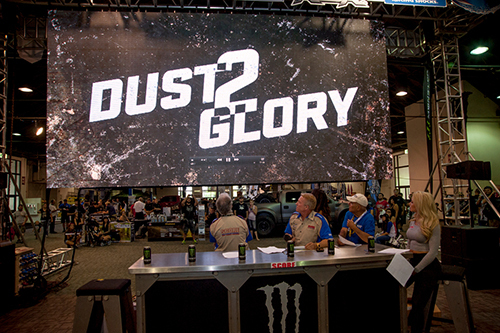 POMONA, Calif., USA—Another radically rugged race course of approximately 840 miles for the granddaddy of all desert races was unveiled Saturday at the SCORE Baja 1000 exhibit area in Building 5 at the Lucas Oil Off-Road Expo at the Fairplex in Pomona, Calif. 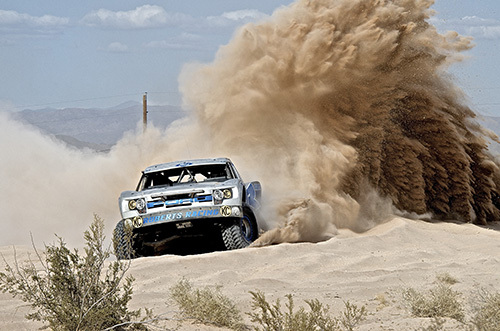 The season finale of the five-race 2015 SCORE World Desert Championship is expecting nearly 250 entries, from 25 countries and 40 U.S. States to compete in this year’s 48th annual Bud Light SCORE Baja 1000. 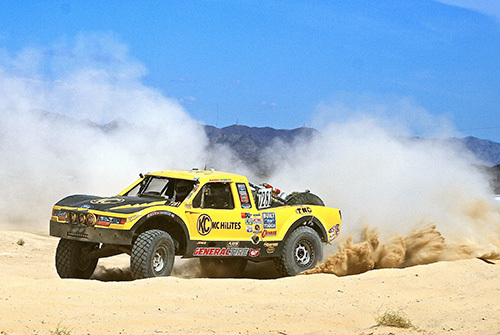 The race week festivities will cover Nov. 17-21, with the race and all side events starting and finishing in Ensenada, Baja California, Mexico. Entry registration for the race is available at Register Here for Race. 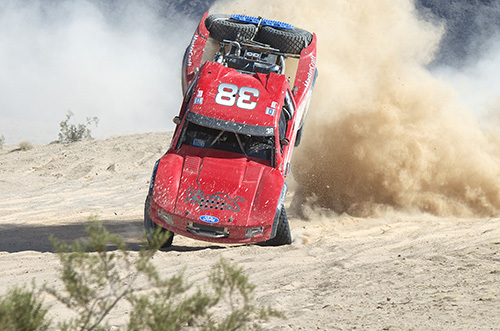 The drawing for starting positions for all classes, except the featured SCORE Trophy Truck and unlimited Class 1 will be held Wednesday, Oct. 28. SCORE Trophy Truck, the marquee SCORE racing division for high-tech, 850-horsepower, unlimited production trucks and Class 1 open-wheelers will once again have a special qualifying session for start positions on Tuesday, Nov. 3 on a special 3.6-mile course on the off-road track at the Las Vegas Motor Speedway. 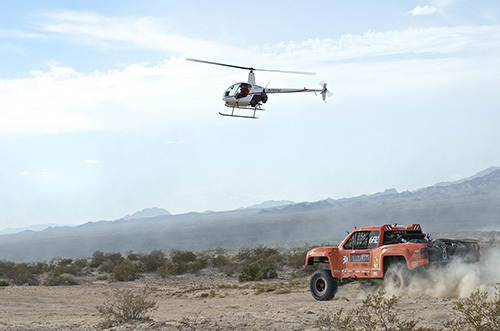 The two top SCORE racing classes will be featured that week in the massive SEMA SCORE Baja 1000 Experience during the SEMA Show at the Las Vegas Convention Center. 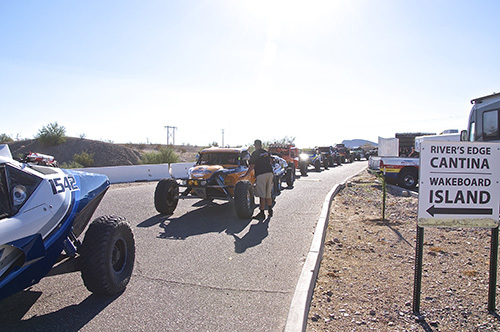 Crowd favorite autograph sessions took place on Saturday and will again on Sunday with many of the stars of the sport, both past and present who have built their legacy in the Bud Light SCORE Baja 1000. 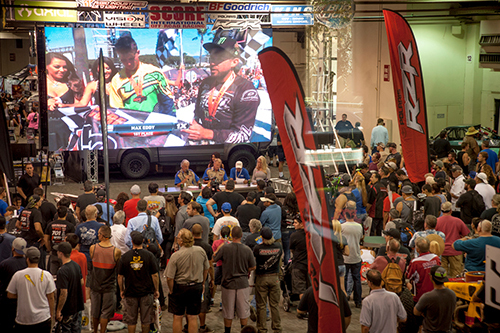 Additional highlight of the SCORE Baja 1000 exhibit is the SCORE Monster Energy Cinema, featuring SCOREvision, massive multiple LED screens showing race telecasts that have aired on the CBS Sports Network as well as historical race videos that are part of the legendary legacy of SCORE Baja racing. 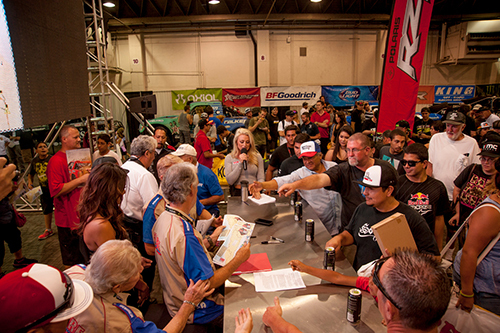 Among the legends, past and present, scheduled to appear at the at Sunday’s noon to 2 p.m. PT SCORE Baja 1000 autograph sessions are SCORE owner Roger Norman, Ivan ‘Ironman’ Stewart, Rod Hall, Rob MacCachren, Mark Samuels, Carlos Lopez, Eduardo Laguna, Jonathan Brenthel, Jordan Brenthel, Justin Lambert, Cameron Steele, Heidi Steele and Ricky Brabec/Max Eddy Jr. 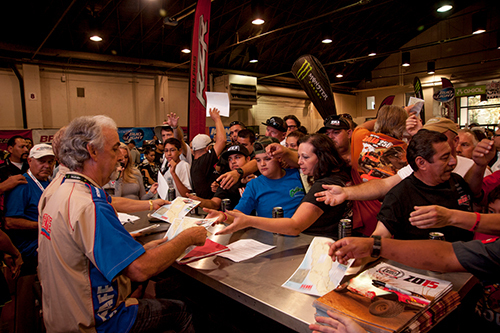 SCORE expects some other ‘surprise’ SCORE Baja racing legends as well for the two autograph sessions. 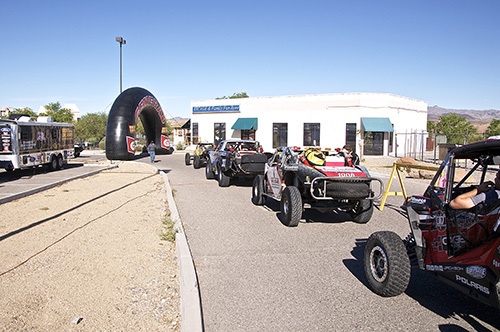 The SCORE Baja 1000 Exhibit at the Off-Road Expo includes multiple vehicle displays as well. 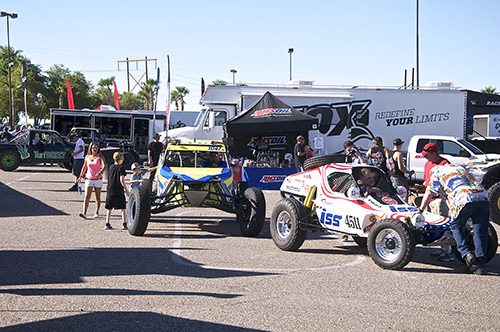 Among the vehicles on display are the legendary Terrible Herbst Motorsports ‘Landshark’ unlimited Class 1 open-wheel race car built by Mike Smith, driven by Troy Herbst to six SCORE point championships. Also on display will be Roger Norman’s SCORE Trophy Truck, Mickey Thompson’s restored vintage Class 2 open-wheeler, Steven Eugenio’s SCORE Trophy Truck, Rugged Radio’s Class 11 VW Sedan, Justin Lambert’s Cognito Motorsports UTV, Jordan Brenthel’s Trophy Truck Spec, Ricky Brabec’s 1x motorcycle, Colton Udall’s 5x motorcycle, a COPS Racing Class 10 car, the Warrior Built motorcycle and a Baja Challenge Subaru-powered Baja Touring Car from Wide Open Excursions. 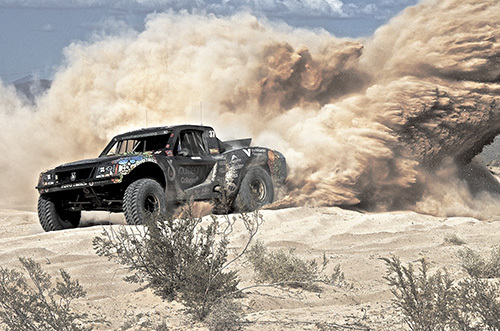 As it has for over four decades, SCORE has put together another memorable race course, this one for a loop race, with all of the foreboding, unforgiving terrain the northern state of the majestic Baja California peninsula has to offer. Starting and finishing in the heart of Ensenada in front of the historic Riviera del Pacifico Cultural Center, the course travels in a counter-clockwise direction. 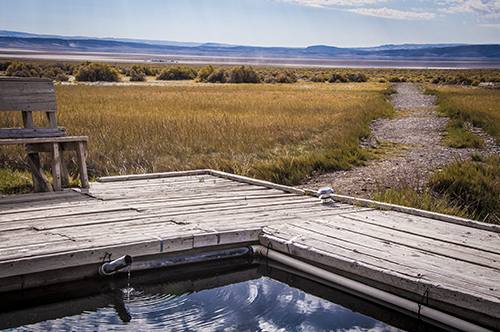 It includes the approximate 35 mile stretch to Ojos Negros which is used in both directions. 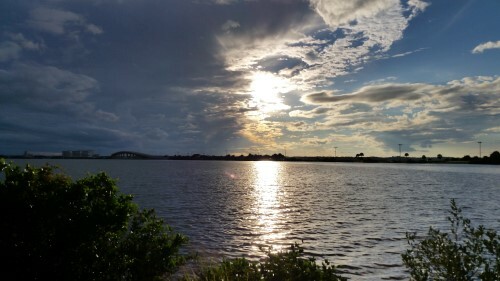 Outgoing, the course heads south from Ojos through Santo Tomas and along the Pacific Ocean. 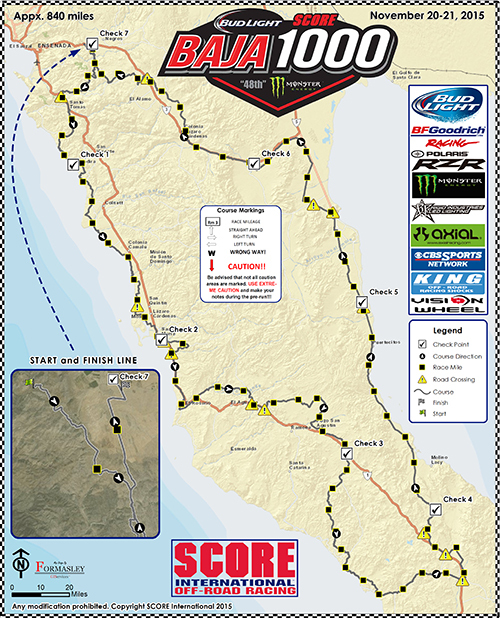 Featuring seven checkpoints, the approximately 840-mile course covers both sides of the peninsula parallels Highway 1 for nearly half of the race, looping south back to the Pacific and then crossing over to the other side of the peninsula below Puertocitos. 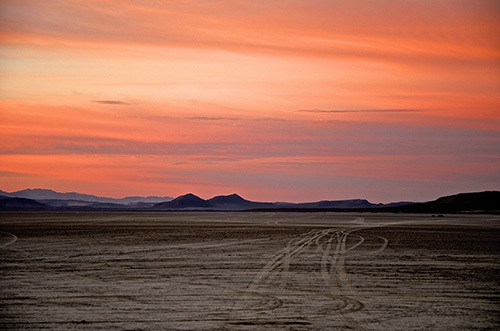 The course then heads back North along the Sea of Cortez, past San Felipe paralleling Highway 5 and up to the junction with Highway 3. 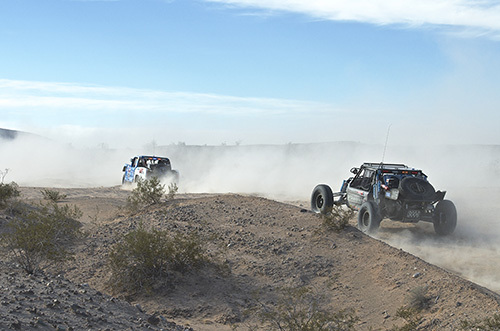 The rugged course then parallels Highway 3 traveling west then northwest back into Ojos Negros and the finish line in Ensenada. Pre-running is expected to open near the end of October, allowing competitors nearly three weeks of practice time on the course. 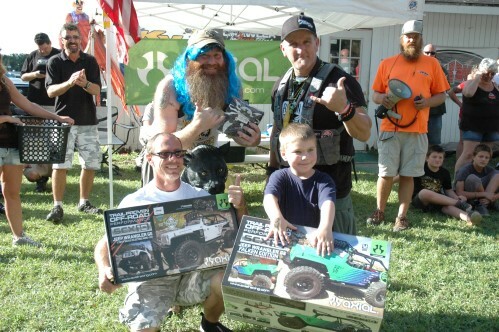 The 2015 Lucas Oil Off-Road Expo is the greatest collection of off-road companies, parts, equipment, gear, and experts assembled in America. 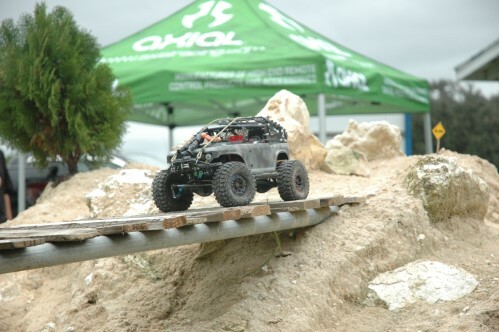 From off-road racing to rock crawling, trail riding to sand sports, motorcycles to ATV’s and camping to adventure travel, the event provides the unique opportunity to meet and talk with the most knowledgeable people in the off-road industry. 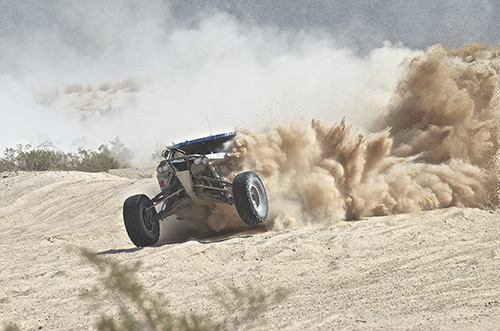 With a full weekend of excitement, other event features include over 300 industry-specific vendors, the Lucas Oil Off-Road Racing Demo at the MAV TV Proving Grounds, Rubicon Trail – Off Road Vehicle Ride Along, Radio vehicle demonstrations, DragonFire Racing ride along, the Miss Off-Road Expo Contest and live music all weekend at the Budweiser Stage. 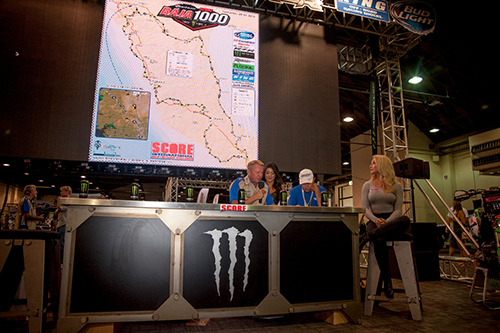 The SCORE Baja 1000 exhibit at the Expo includes live internet coverage on SCORE Live HD (www.score-international.com) with interviews with the SCORE Baja legends, the Monster girls. Announcers are George Antill and Dianna Dahlgren. 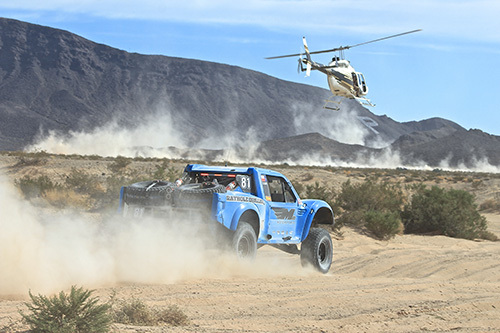 All races in the 2015 SCORE World Desert Championship series, along with the special SEMA SCORE Baja 1000 Experience and qualifying for the Bud Light SCORE Baja 1000 from Las Vegas Motor Speedway will once again be aired in the USA and Canada on the CBS Sports Network. 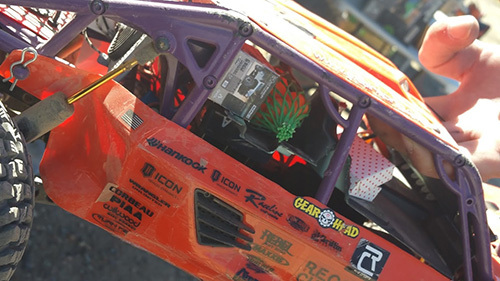 New for 2015, in addition to SCORE Trophy Truck coverage, the shows will also feature top action and highlights from many other classes of trucks, buggies, motorcycles, quads and UTVs – making sure that the most exciting footage and most compelling stories are now part of each race event broadcast. 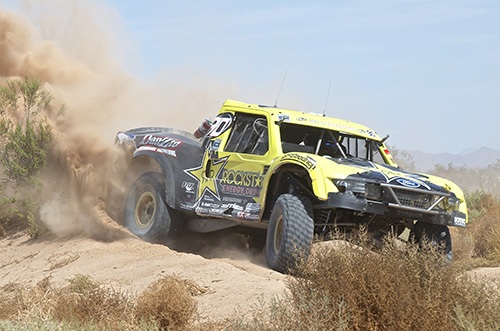 · Rigid Industries SCORE Imperial Valley 250, presented by the city of El Centro, Sept. 24-27, Coyne Powersports Motorplex-Plaster City, Calif.
Issue No. 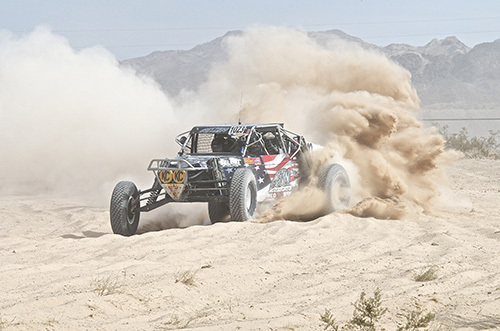 8 of the SCORE Journal, the new monthly on-line digital magazine of SCORE International and the five-race SCORE World Desert Championship, is live on the SCORE website at www.SCORE-International.com and is available through SCORE social media channels as well as a direct link at http://scorejournal.digital. The new digital magazine, which includes numerous linked video segments, is a major element in the media expansion that SCORE is implementing for 2015 which includes its most aggressive national and international television packages, four new online video series, each with 26 episodes and a new consumer based SCORE website.